The webpage e-kere presents the publishing and research activity of the Research and Publications Centre (KERE), and of Manolis K. Hatziyakoumis. 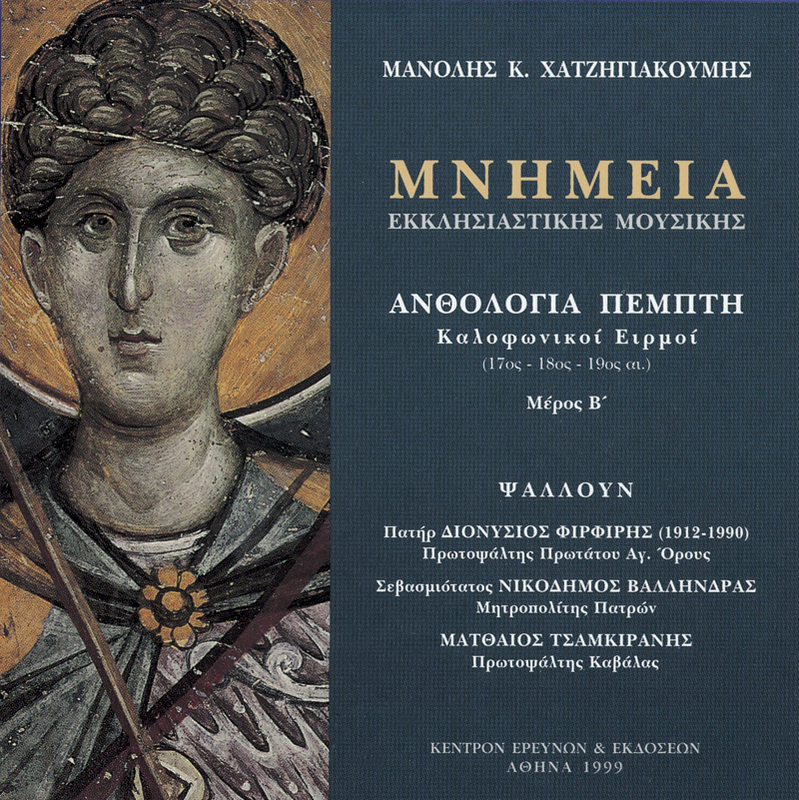 In particular, works about Byzantine Music are presented and, especially, the Byzantine Music publishing Series “Monuments”, “Miscellaneous”, “Archive”, and all music and philological books. 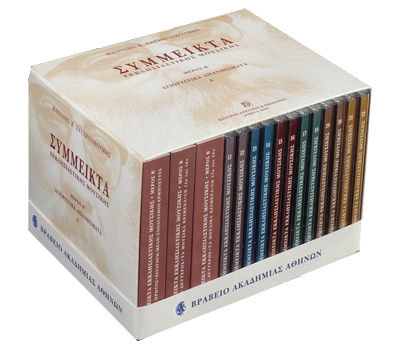 Such works provide an in-depth historical knowledge mainly of Modern Hellenism, and contribute effectively to the realization and success of what is termed nowadays cultural self-awareness of a nation. 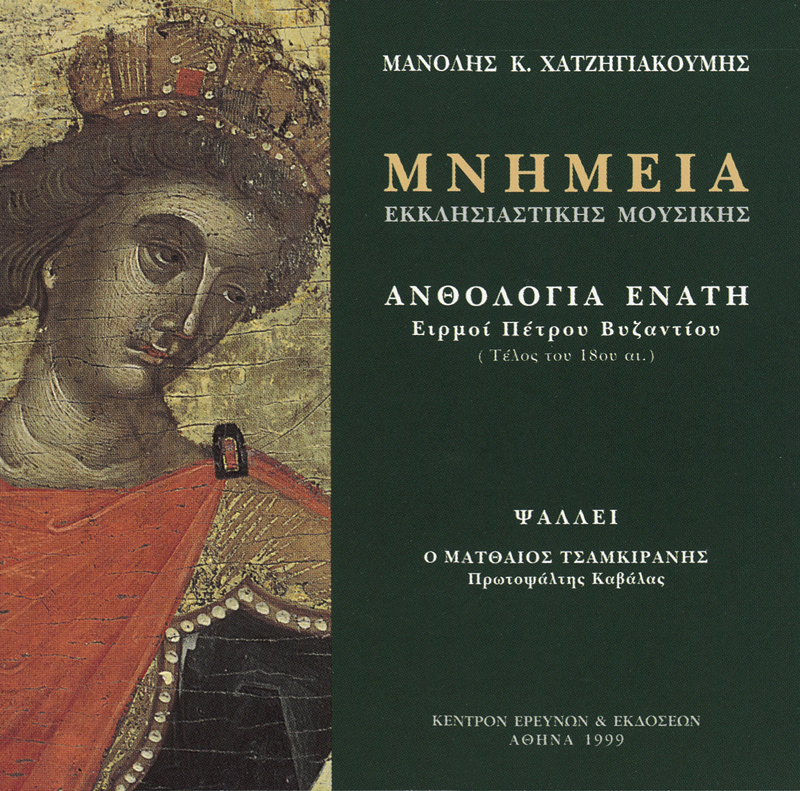 Orthodox Ecclesiastical Music (known today as Byzantine Music) is one of the most important intellectual and artistic expressions not only of the Byzantine era but also of Modern Hellenism. This kind of music possesses some special characteristics: 1) it is exclusively vocal; 2) it has a long performative oral tradition which is still alive nowadays; and 3) numerous written music sources (from 10th century onwards), manuscripts (until 1820) and publications (from 1820 onwards) are available. However, this very important national cultural field remains on the outskirts of in depth scientific research (philological – historical – musical). Two publishing series move to this direction: “Monuments” and “Miscellaneous” of Ecclesiastical Music. These series have been planned and realized by Manolis K. Hatziyakoumis, Scholar, PhD of the University of Athens (from 1983 to 1992 through the National Institute of Research, also supported by the General Secretary of the Ministry of Research and Technology). It is a work in progress which has already been published since 1999 by the non-profit “Research & Publications Centre”, financed by the Ministry of National Economy. Division into Corpora is based on the music forms included, as these forms have been formulated within the Orthodox liturgical practice. 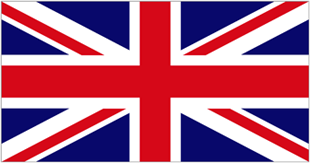 The selection contains, in this phase, Hymns of the modern period (mainly 16th–19th centuries), i.e. a period with an extraordinary, rich and unreleased music material. All the Hymns are performed by old traditional chanters, the last of a long performative tradition. Some of them passed away (Thrasyvoulos Stanitsas †1987, Father Dionysios Phirphires †1990, Father Panayiotis Tsinaras †1995, Leonidas Sphekas †2000). The contents of this Series cover a long interval and a wide variety of music forms. First there is an introductory short series titled Anthologies (10 Anthologies already released), which contains a random but indicative selection of Hymns of the complete Series. Then, there are the seven Corpora including Hymns classified according to their music forms. In the first Corpus, only Eight-Mode Hymns & Systems are included (16th–20th centuries) and the Hymns are performed by different chanters (22 CDs, all released). These Hymns are some of the greatest and most extended compositions of the Ecclesiastical music philology. 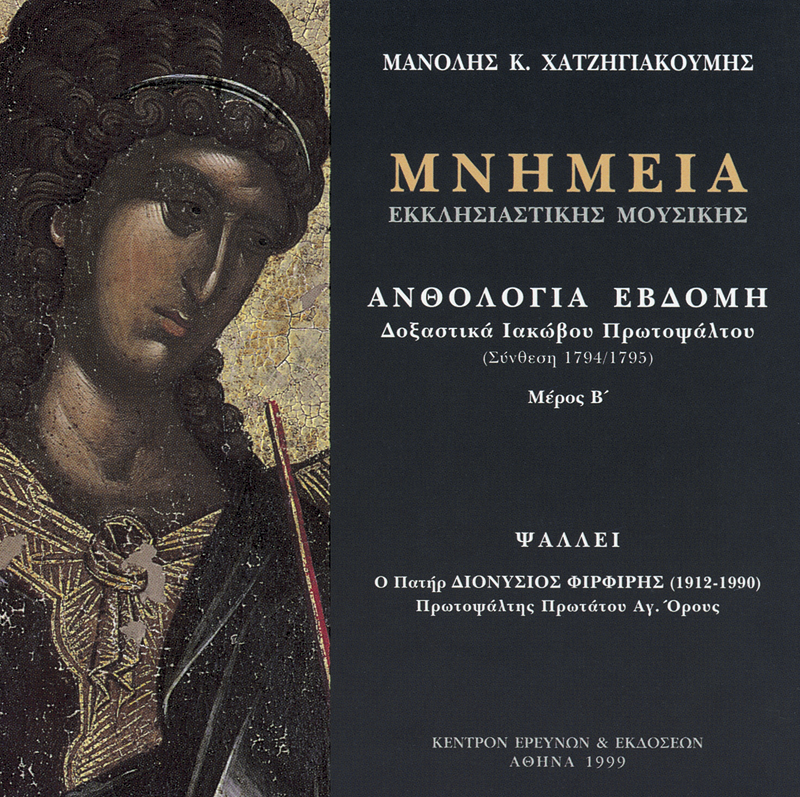 Some of them are from unknown manuscripts and released for the first time such as Timiotera by Konstantinos of Aghialos (late 16th century, CD no 1), Psallontes sou ton tokon by Petros Bereketes (flourished between 1680 and 1710/1715), one of the masterpieces of this form (duration 2 hours and 18 minutes, CDs no 5 and 6), the Cherubic Hymn psallomenon kai eis tous okto echous, unique and original for its compositional form, by the same composer (CDs no 7 and 8). Other Hymns are released from incunables and unreleased editions, such as Timiotera by Damianos of Vatopedi (late 17th century, CD no 2), Rodon to Amaranton by Chourmouzios Chartophylax (†1840) and Nikolaos, Protopsaltes of Smyrna (†1887) (CD no 12), Antiphona by Manouel Protopsaltes (†1819, CD no 13), the brilliant Polyeleos Exomologeisthe to Kyrio by Petros Ephesios (from his unknown Anthology, Bucharest 1830, CD no 14). On the contrary, the rest of the Hymns are still active with a long chanting tradition, and the performances in these discs by the particular chanters constitute unique historical recordings. 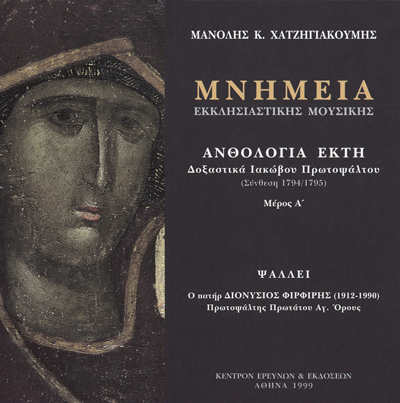 Such instances are Theotoke Parthene by Petros Bereketes, a Ηymn universally acknowledged as a masterpiece (CDs no 5 and 6), the historical Doxastikon Thearchio Nevmati by Iakovos Protopsaltes (†1800), which is still chanted nowadays on Mount Athos (CD no 9), Cherubic Hymns by Konstantinos Protopsaltes (†1862), and Koinonika by Ioannis Protopsaltes (†1866); the last two are both chanted at the Ecumenical Patriarchate (CDs no 15 – 17); finally, Cherubic Hymns and Koinonika by Theodoros Phokaeos (†1851) which have been fully adopted into the Chanters’ practice (CDs no 18 – 21). Corpora Two to Seven: in Corpus Two, various chanters perform Kalophonic Heirmoi (17th, 18th and 19th centuries), a historical music form of special interest for its nonliturgical and peculiar nature (14 CDs, already in print); in Corpus Three, Doxastika by Iakovos Protopsaltes (date of composition 1794/1795), a living tradition on Mount Athos, are chanted by Father Dionysios Phirphires, Monk of Mount Athos, (23 CDs); in Corpus Four, Katavasies by Petros Peloponnesios (date of composition between 1764 and 1770), are chanted by Bishop Nicodemos Vallendras (8 CDs); in Corpus Five, Heirmologion of Kanons by Petros Byzantios (date of composition late 18th century), is chanted by Matthew Tsamkiranes (5 CDs); in Corpora Six and Seven, Polyeleoi and Kratemata, composed by different church musicians, are performed by different chanters (under preparation). All the above mentioned Hymns are performed by important traditional chanters, the last of a great performing tradition. Some of them passed away: Thrasyvoulos Stanitsas (1910–†1987), Archon Protopsaltes of the Ecumenical Patriarchate, Father Dionysios Phirphires (1912–†1990), Protopsaltes of the Protato of Athos, Reverend Bishop Nicodemos Vallendras (born in 1915), Vasileios Emmanouelides (born in 1932), Archon Lampadarios of the Ecumenical Patriarchate, Leonidas Asteris (born in 1936), current Archon Protopsaltes of the Ecumenical Patriarchate, Father Georgios Tsetses (born in 1934), Great Head Priest of the Ecumenical Patriarchate, Father Panayiotis Tsinaras (†1995), head priest of the Patriarchate Church at Phanari, Leonidas Sphekas (1921–†2000), Protopsaltes of Athens and Chios, Matthew Tsamkiranes (born in 1925), Protopsaltes of Kavala, Charilaos Taliadoros (born in 1926), Archon Protopsaltes of Thessaloniki, and Antipas (born in 1955), Amphilochios (born in 1961), Philotheos (born in 1963) and Joseph (born 1958), younger Monks of Athos. They are Chanters who all keep the style and technique untouched by modern influences or overlaps, and observe faithfully the traditional performance. In this perspective, these recordings should be considered a highly important scientific event in terms of music performance. In addition to the great amount of original Hymns and important Chanters, the pure philological character of this Edition should be emphasized. The philological character of the Edition is documented by all the data, but mostly by the long and complex books available. These books record a) all the necessary historical and philological data, analysis of Hymns, evaluation of each performance, short personal details of composers and performers; b) the original Manuscripts (transcribed with a specific Computer Program) or incunables – old music texts from which the Hymns are chanted; and c) philological supplements, introductions, indexes, inventories, rich photographic material etc. The historical Hymns composed by various composers, the traditional Chanters, and the philological character demonstrate indisputably the originality and significance of this long publishing series of “Monuments”. The Series “Miscellaneous of Ecclesiastical Music” has common characteristics with the previous one, but different aims and content. In this Series, several Hymns are released together (in volumes and CDs with serial numbers) regardless of their music form, theme or time of composition. It is a series with two principal aims: to include progressively the important authentic Chanters, and collect, at the same time, all the traditional – old and new – Hymns which continue to exist and are used in contemporary liturgical practice. 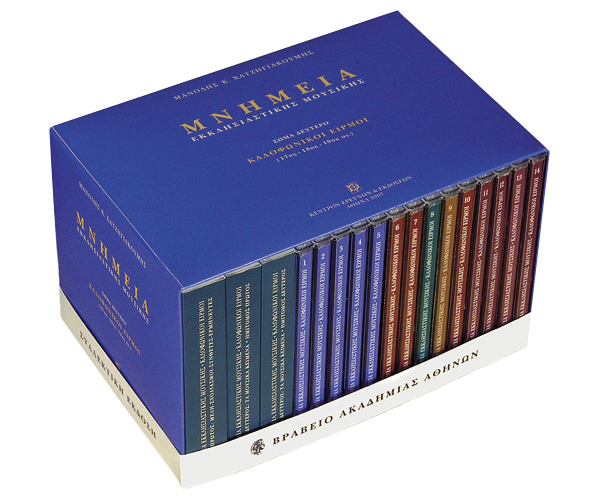 From the series “Miscellaneous”, the first ten (10) CDs are already available (ΣΟ 01 – ΣΟ 10) in seven volumes and individually in a case as Part A’. 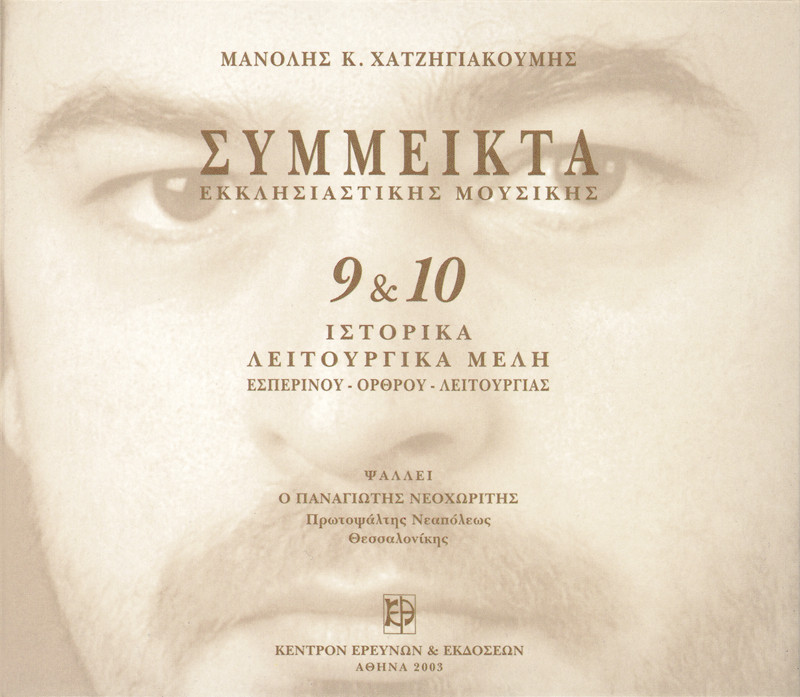 The next ten CDs (ΣΟ 11 – ΣΟ 20) are also ready for release as Part B’. In the first volume (CD no 1) titled “Anthology of Old Hymns”, Thrasyvoulos Stanitsas, Archon Protopsaltes, chants (recording of 1980) exclusively old historical Hymns of the 14th, 17th and 18th centuries, many of which are still chanted in the Patriarchate Cathedral (a unique performative Monument of the traditional chanting mode and style). 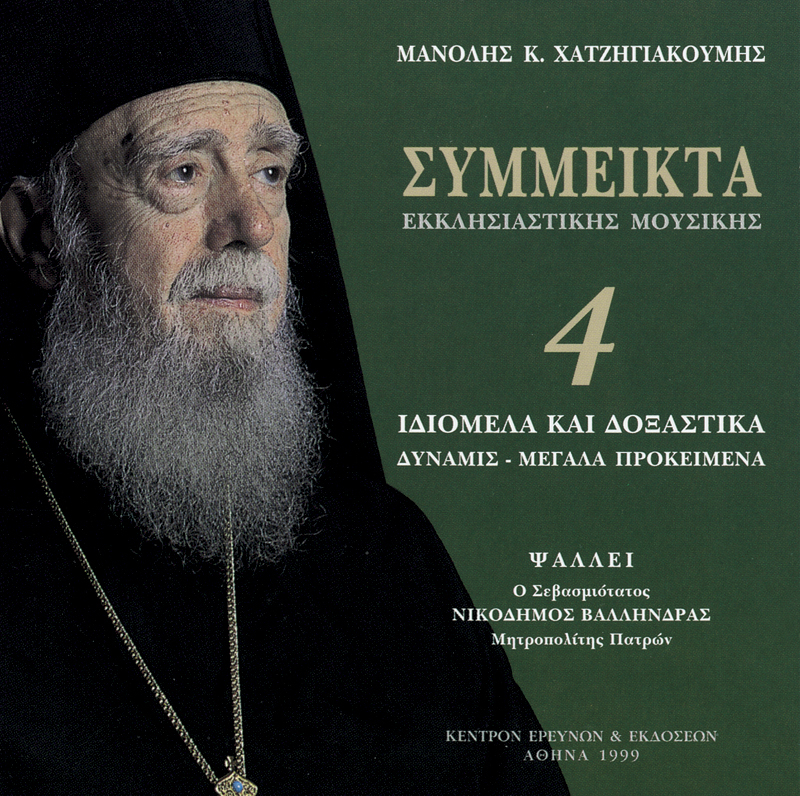 In the second volume (CDs no 2 – 3) titled “Great Lent” and “Holy week” respectively, Father Georgios Tsetses, Great Head Priest of the Ecumenical Patriarchate, chants “keeping the style and tradition of the Great Church of Christ”. These runs demonstrate the rich, gentle, imposing but devout and irreplaceable melismatic, Doric, Patriarchal style – particularly of the Hymns for the Holy Week. 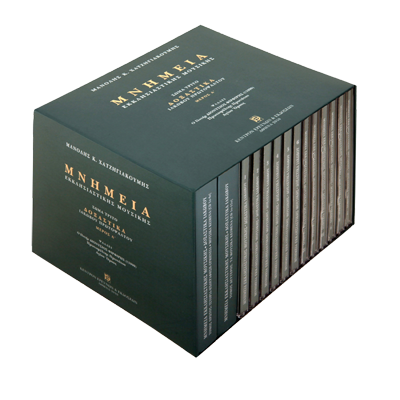 In the third volume (CD no 4) titled “Idiomela and Doxastika. Dynamis. Megala Prokeimena”, Reverend Bishop Nicodemos Vallendras is the chanter. This volume contains compositions written by him and certain Hymns by the brilliant Chanter Nikolaos, Protopsaltes of Smyrna. In this disc, personal musical expression, long liturgical experience, and familiar performance coexist in a unique and unusual way. 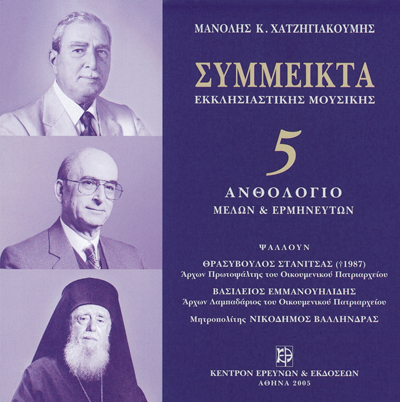 In the fourth volume (CD no 5) titled “Amomos. Funeral and Memorial”, Father Georgios Tsetses, Great Head Priest, chants keeping the oral tradition of Constantinople. This disc also contains an unknown Hymn by Manouel Doukas of Chrysaphes (flourished between 1440 and 1465), the great musician of Byzantium. This Hymn was composed ad hoc for the Fall of Constantinople (1453). It is a rare and unique historical music source. In the fifth volume (CD no 6) titled “Music Anthology”, Thrasyvoulos Stanitsas, Archon Protopsaltes, Vasileios Emmanouelides, Archon Lampadarios, and Bishop Nicodemos Vallendras chant Hymns which have remained from older historical recordings. In the sixth volume (CDs no 7 – 8) titled “Litourgika by Constantinopolitan Composers of the 20th century”, Father Georgios Tsetses, Great Gead Priest, is the chanter offering a brilliant example of the existing music tradition and historical continuum in the area of Constantinople. In the seventh volume (CDs no 9 – 10) titled “Historical Liturgical Hymns”, the 32-year old Panayiotis Neochorites, Protopsaltes Neapoleos of Thessaloniki, chants a collection of historical Hymns “Vespers – Matins – Liturgy” which are used in the Liturgical practice. Based on the above, the series “Miscellaneous” contains a timely music material performed by brilliant, selected, contemporary, unknown to many, genuine chanters. Moreover, the second Series records and showcases the great oral performative tradition of contemporary ecclesiastical music practice. In this perspective, the Series is of particular significance. The main elements (as main objectives of the Series), in terms of form and tradition, are the following in both publishing Series: 1) Many different old Hymns in the “Monuments” series, and newer Hymns in the “Miscellaneous” series. The first Series includes mainly unknown and often unreleased masterpieces which cover a wide and neglected time period (16th–19th centuries). This historical material actually introduces the character of the specific Edition and contributes, at the same time, to the promotion (and knowledge) of an original and particularly interesting music culture. 2) Historical performances widely exploiting the long oral tradition as this has been built by the excellent traditional Chanters. These performances teach the correct approach to (and correct learning of) this great vocal music art for the present and the future. 3) Philological documentation with full reference to music forms, Hymns, poetical texts, composers and chanters. These elements should be considered useful guides, while effectively informing on the milieu of that historical era. Another reason for that would be that there are frequent references to other social and artistic expressions of Modern Hellenism. 4) Accompanying music texts (manuscripts, incunables, first editions) used for Hymn chanting. The parallel publication of the music texts constitutes, in fact, an essential philological element of the Edition and, at the same time, a very valuable tool for expert listeners. 5) The sound and artistic result. The final sound – rich, clear and natural – is a new proposal to the field of ecclesiastical recording since the intellectual and spiritual character of this kind of music is strengthened. Also, the artistic appearance – plain, strict and smooth – achieves the same goal: to serve and make known the high quality of this great religious and ecclesiastical music art. The old, rich repertoire, the traditional Chanters, the philological structure, the historical documentation, as well as the sound quality, the plain but perfect appearance, as well as the non-profit character of the Edition, and the support of the State, all these elements give both these Series, “Monuments” and “Miscellaneous” of Ecclesiastical Music, the characteristics of National Editions. Such works contribute effectively to the realization and success of what is termed nowadays cultural self-awareness of a nation. First and Second Anthologies (MA 01 – MA 02) [Volume 1]. These Anthologies include Hymns of the 17th, 18th and 19th centuries. Father Dionysios Phirphires, Protopsaltes of the Protato of Athos, Thrasyvoulos Stanitsas, Archon Protopsaltes of the Ecumenical Patriarchate, Vasileios Emmanouelides, Archon Lampadarios of the Ecumenical Patriarchate, Bishop Nicodemos Vallendras, Leonidas Sphekas, Protopsaltes of Chios and Athens, Matthew Tsamkiranes, Protopsaltes of Kavala, and Antipas, Amphilochios, Philotheos and Joseph, Monks of Athos, are the chanters. Set of two (2) CDs with a 184 page booklet. [Research & Publications Centre, Athens 1999]. Third Anthology (MA 03) [Volume 2]. This Anthology includes Hymns in the Eight-Mode System of the 17th, 18th and 19th centuries. Bishop Nicodemos Vallendras, Father Dionysios Phirphires, Matthew Tsamkiranes, and Antipas and Amphilochios, Monks of Athos, are the chanters. One (1) CD with a 104 page booklet. [Research & Publications Centre, Athens 1999]. Fourth and Fifth Anthologies (MA 04 – MA 05). [Volume 3]. 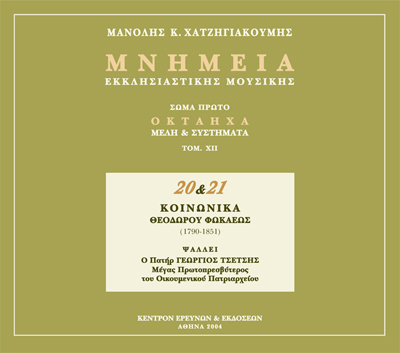 These Anthologies include Kalophonic Heirmoi (17th–19th centuries). Thrasyvoulos Stanitsas, Archon Protopsaltes of the Ecumenical Patriarchate, Dionysios Phirphires, Protopsaltes of the Protato of Athos, Bishop Nicodemos Vallendras, and Matthew Tsamkiranes, Protopsaltes of Kavala, are the chanters. Set of two (2) CDs with a 160 page booklet. [Research & Publications Centre, Athens 1999]. Sixth and Seventh Anthologies (MA 06 – MA 07) [Volume 4]. These Anthologies include Doxastika by Iakovos Protopsaltes (late 18th century). Father Dionysios Phirphires, Protopsaltes of the Protato of Athos, is the chanter. One (1) CD with a 144 page booklet. [Research & Publications Centre, Athens 1999]. Eighth Anthology (MA 08) [Volume 5]. This Anthology includes Katavasies by Petros Peloponnesios (composed between 1764 and 1770). Bishop Nicodemos Vallendras is the chanter. One (1) CD with a 116 page booklet. [Research & Publications Centre, Athens 1999]. Ninth Anthology (MA 09) [Volume 6]. This Anthology includes Heirmoi of the Kanon by Petros Byzantios (late 18th century). Matthew Tsamkiranes, Protopsaltes of Kavala, is the chanter. One (1) CD with a 144 page booklet. [Research & Publications Centre, Athens 1999]. Tenth Anthology (MA 10) [Volume 7]. This Anthology includes Triadika of Polyeleos (19th century). Leonidas Sphekas, Protopsaltes of Athens and Chios, is the chanter. One (1) CD with a 104 page booklet. [Research & Publications Centre, Athens 1999]. 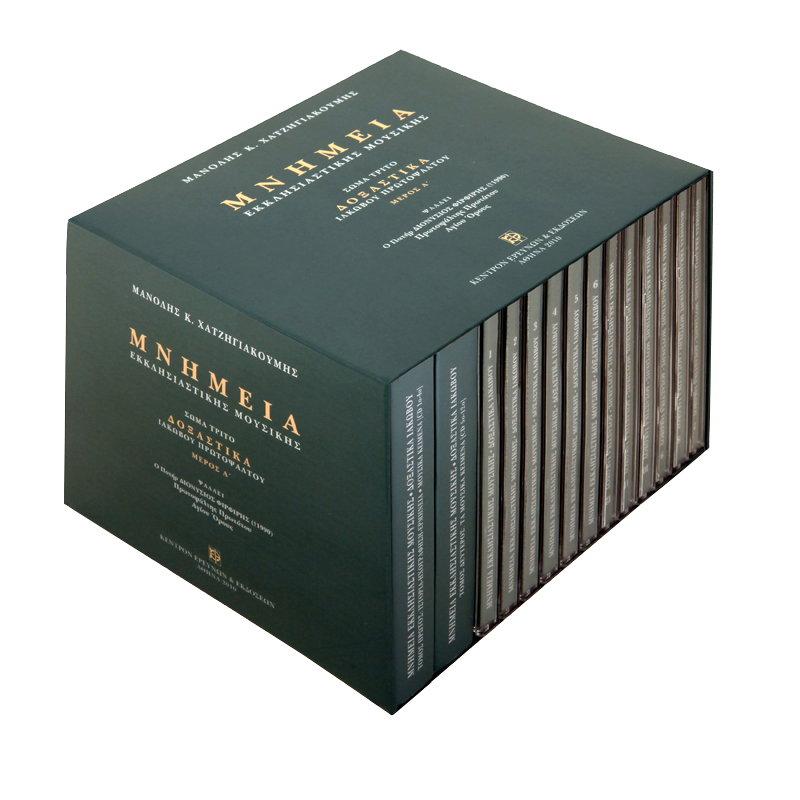 The Anthologies are also available in a single box set of 10 CDs (MA 01 – MA 10) titled “Anthologies First to Tenth” with three booklets of 248, 216 and 216 pages respectively. [Research & Publications Centre, Athens 2000]. CORPUS ONE. EIGHT-MODE HYMNS AND SYSTEMS. First and Second CDs (MO 01 – MO 02) [Volume 1]. These discs include Timiotera by Konstantinos of Aghialos (late 16th century; the composer’s autograph is preserved) and Timiotera by Damianos of Vatopedi (late 17th century). Antipas, Amphilochios, Philotheos and Joseph, Monks of Athos, are the chanters. Set of two (2) CDs with a 116 page booklet. [Research & Publications Centre, Athens 2001]. Third and Fourth CDs (MO 03 – MO 04) [Volume 2]. 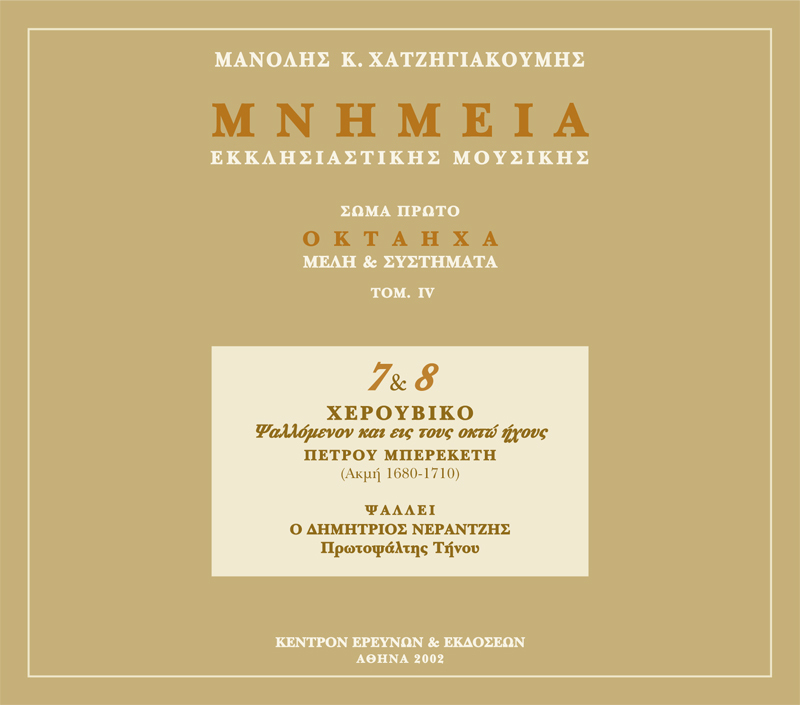 These discs include Theotoke Parthene by Petros Bereketes (flourished between 1680–1710/1715). Thrasyvoulos Stanitsas, Archon Protopsaltes of the Ecumenical Patriarchate, and Father Dionysios Phirphires, Protopsaltes of the Protato of Athos, are the chanters. Set of two (2) CDs with a 106 page booklet. [Research & Publications Centre, Athens 2001]. Fifth and Sixth CDs (MO 05 – MO 06) [Volume3]. These discs include an unknown and unreleased Hymn Psallontes sou ton tokon by Petros Bereketes (flourished between 1680–1710/1715). This is a unique vocal composition in the history of world music philology. It lasts two hours and 18 minutes. Antipas and Amphilochios, Monks of Athos, are the chanters. Set of two (2) CDs with a 140 page booklet. [Research & Publications Centre, Athens 2001]. Seventh and Eighth CDs (MO 07 – MO 08) [Volume 4]. 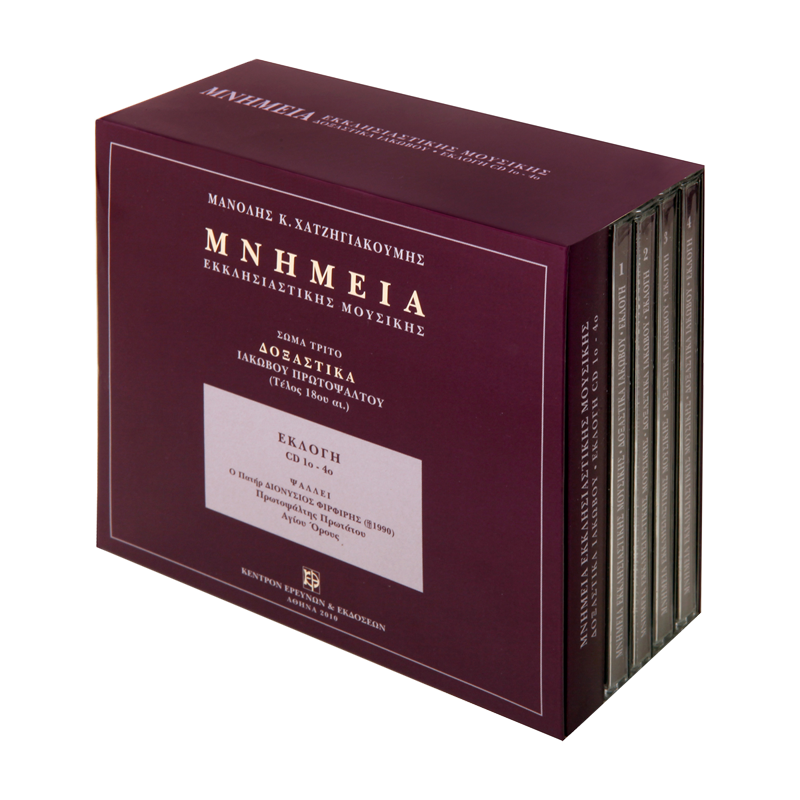 These discs include an unreleased Cherubic Hymn chanted in Eight Modes by Petros Bereketes (flourished between 1680–1710/1710). This Hymn is a rare and unique piece in the entire history of Ecclesiastical Music. Demetrios Nerantzes, Protopsaltes of Tinos island, is the chanter. Set of two (2) CDs with a 116 page booklet. [Research & Publications Centre, Athens 2001]. Ninth CD (MO 09) [Volume 5]. This disc includes one of the most important historical Hymns, Thearchio Nevmati by Iakovos Protopsaltes, (flourished between 1760 and †1800). Father Dionysios Phirphires, Protopsaltes of the Protato of Athos, is the chanter. One (1) CD with a 60 page booklet. [Research & Publications Centre, Athens 2002]. Tenth and Eleventh CDs (MO 10 – MO 11) [Volume 6]. These discs include Kekragaria and Pasapnoaria of Ainoi by Iakovos Protopsaltes, (flourished between 1760 and †1800). 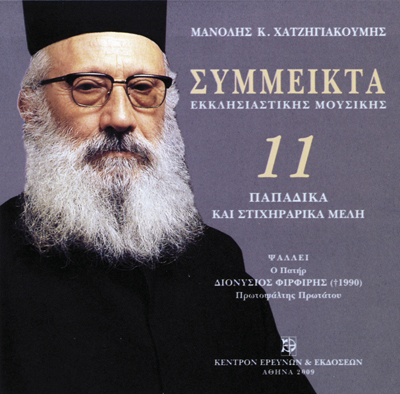 Vasileios Emmanuelides, Archon Lampadarios of the Ecumenical Patriarchate, is the chanter. Set of two (2) CDs with a 140 page booklet. [Research & Publications Centre, Athens 2002]. CDs First to Eleventh (MO 01 – MO 11) are also available in a single box set titled “Eight-Mode Hymns & Systems. Part A” with three booklets of 212, 214 and 216 pages respectively. [Research & Publications Centre, Athens 2002]. Twelfth and Thirteenth CDs (MO 12 – MO 13) [Volume 7]. These discs include Rodon to Amaranton by Chourmouzios Chartophylax (between 1770 and †1840) and Nikolaos, Protopsaltes of Smyrna (between 1790 and †1887). They also include Antiphona by Manouel Protopsaltes, (flourished between 1780 and †1819). Matthew Tsamkiranes, Protopsaltes of Kavala, is the chanter. Set of two (2) CDs with a 160 page booklet. [Research & Publications Centre, Athens 2003]. Fourteenth CD (MO 14) [Volume 8]. The disc includes Exomologisthe to Kyrio, an Eight-Mode Polyeleos by Petros Ephesios (from his unreleased Anthology, Bucharest 1830). Matthew Tsamkiranes, Protopsaltes of Kavala, is the chanter. One (1) CD with an 80 page booklet. [Research & Publications Centre, Athens 2003]. Fifteenth and Sixteenth CDs (MO 15 – MO 16) [Volume 9]. 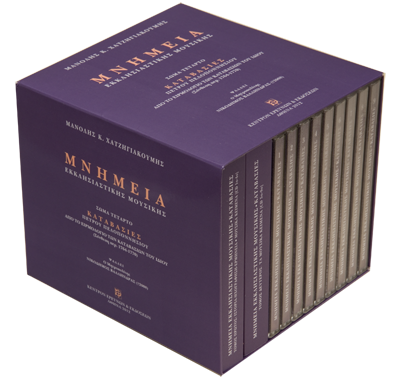 These discs include “arga” (=in slow tempo) Cherubic Hymns by Konstantinos Protopsaltes (1777–†1862). Georgios Kyrmeles, Archon Protopsaltes of Eptalophos of Thessaloniki, is the chanter. Set of two (2) CDs with a 120 page booklet. [Research & Publications Centre, Athens 2006]. 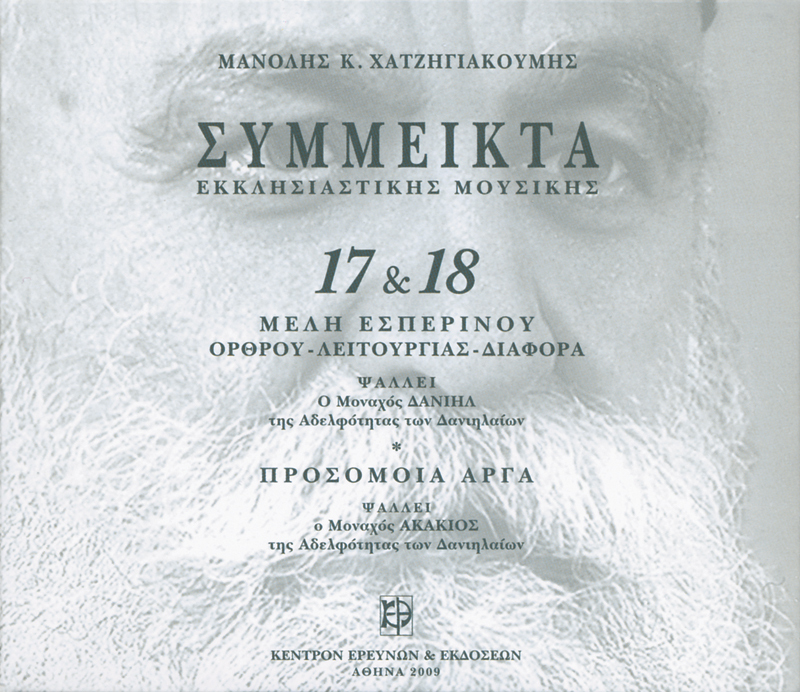 Seventeenth CD (MO 12 – MO 17) [Volume 10]. The disc includes Koinonika by Ioannis Protopsaltes (between 1800 and †1866). Vasileios Emmanouelides, Archon Lampadarios of the Ecumenical Patriarchate, is the chanter. One (1) CD with an 84 page booklet. [Research & Publications Centre, Athens 2004]. Eighteenth and Nineteenth CDs (MO 18 – MO 19) [Volume 11]. 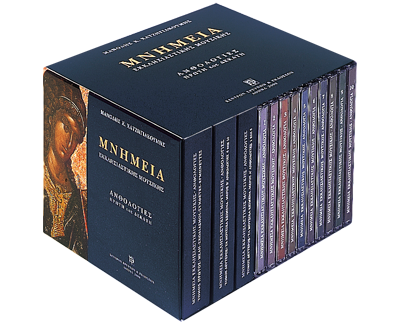 These discs include Cherubic Hymns by Theodoros Phokaeos (between 1790 and †1851). Father Georgios Tsetses, Great Head Priest of the Ecumenical Patriarchate, is the chanter. Set of two (2) CDs with a 100 page booklet. [Research & Publications Centre, Athens 2004]. 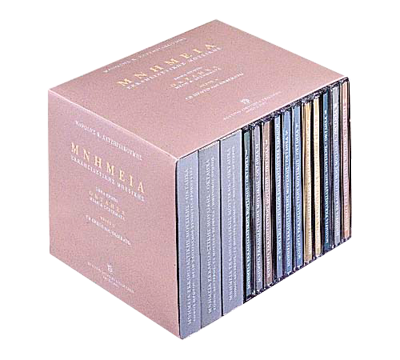 Twentieth and Twenty First CDs (MO 20 – MO 21) [Volume 12]. These discs include Koinonika by Theodoros Phokaeos (1790–†1851). Father Georgios Tsetses, Great Head Priest of the Ecumenical Patriarchate, is the chanter. Set of two (2) CDs with a 114 page booklet. [Research & Publications Centre, Athens 2004]. Twenty Second CD (MO 22). [Volume 13]. 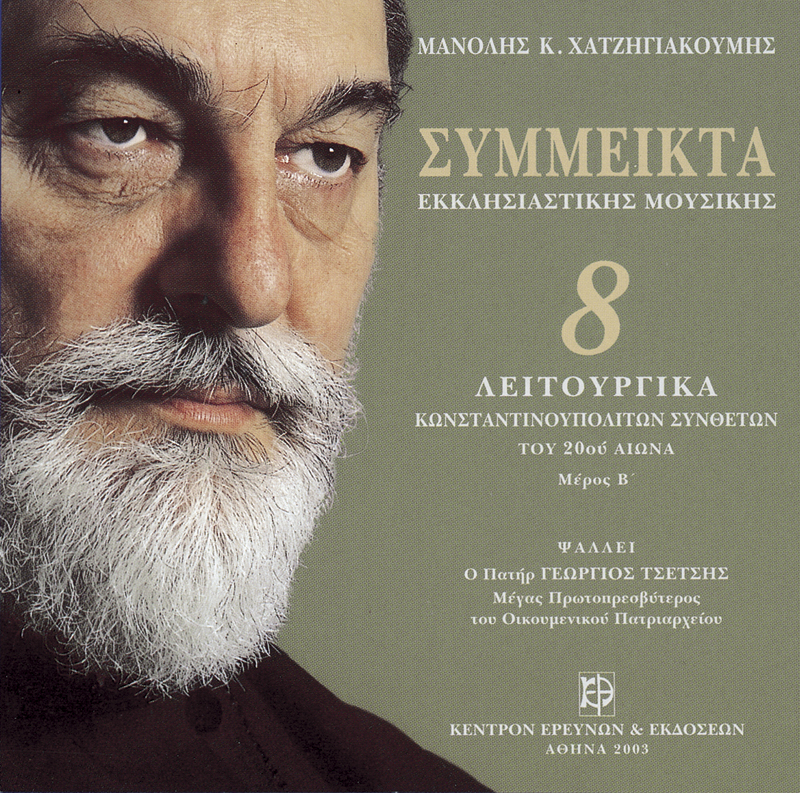 This disc includes Eight-Mode compositions by Bishop Nicodemos Vallendras (Anoixantaria – Makarios anir – Theotoke Parthene). Bishop Nicodemos Vallendras is the chanter. One (1) CD with a 98 page booklet [Research & Publications Centre, Athens 2004]. 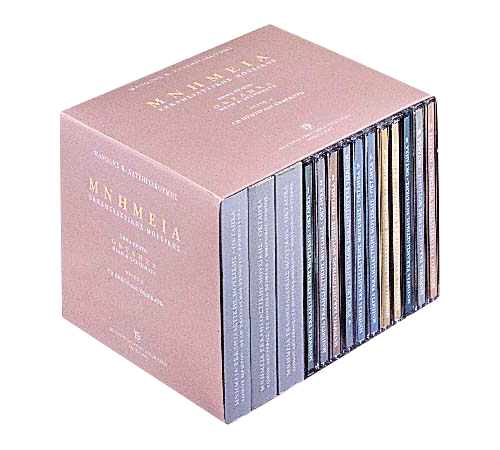 CDs Twelfth to Twenty Second (MO 12 – MO 22) are also available in a single box set titled “Eight-Mode Hymns & Systems. 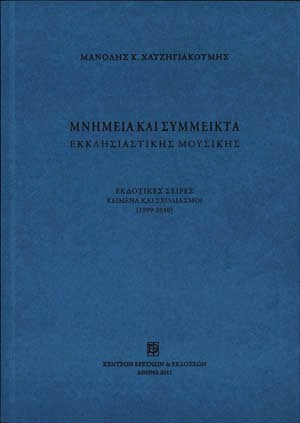 Part B’” with three booklets of 200, 232 and 216 pages respectively, and a remastering of CDs no 17, 18 and 19 [Research & Publications Centre, Athens 2006]. 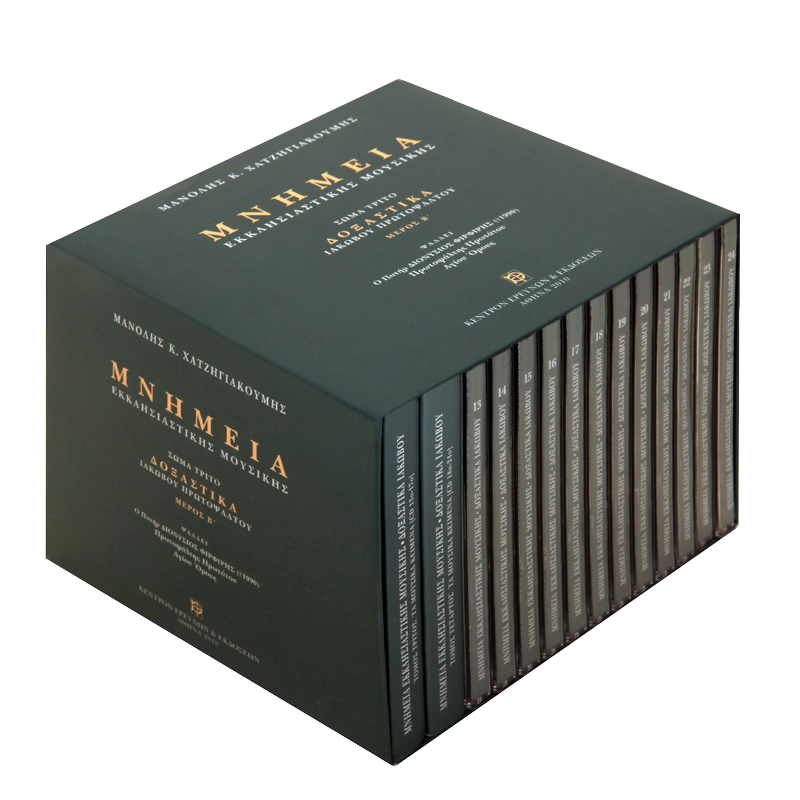 Fourteen (14) CDs (ΜΚΕ 01 – ΜΚΕ 14) in a single box set with three booklets: volume A’, Hymns and Commentary – Composers – Performers – Catalogues – Indexes (224 pages); volumes B1 and B2, Music Texts (196 and 194 pages respectively). In this Corpus, only Kalophonic Heirmoi are included (a music form of the 17th–19th centuries). These Heirmoi (78 in total) are performed almost exclusively from the special music book “Kalophonic Heirmologion” and in particular from its first edition (Constantinople 1836). Few are chanted from the music books “Tameion Anthologias” (Constantinople 1824), “Neon Tameion Mousikis Anthologias” (Smyrna 1867), and “En anthos tis kath’ emas Ecclesiastikis Mousikis” (Constantinople 1897). 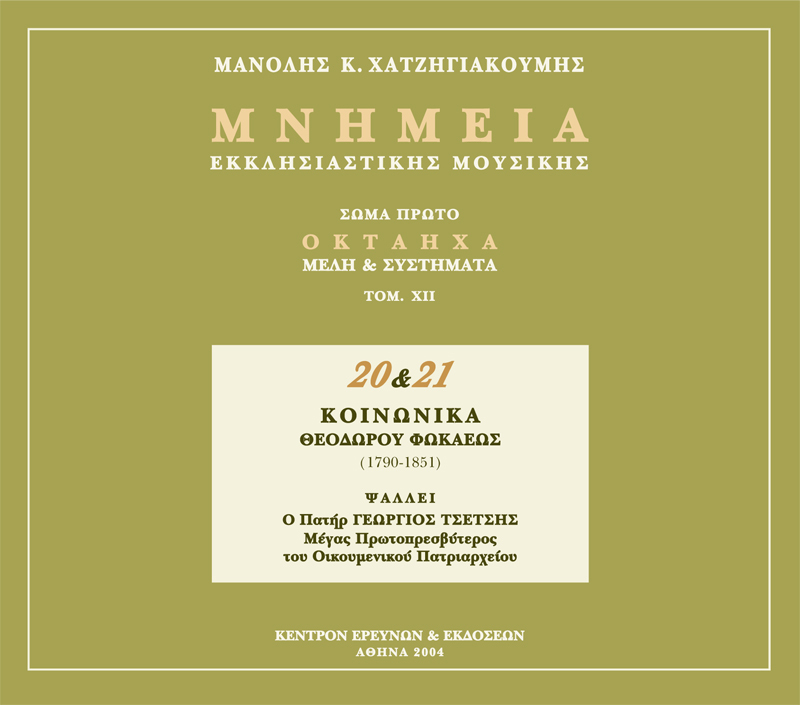 Twenty (20) Kratemata of Kalophonic Heirmoi are also performed from “Kalophonic Heirmologion”. Heirmoi and Kratemata are performed by the most important contemporary traditional chanters (who almost all passed away): Thrasyvoulos Stanitsas (†1987), Archon Protopsaltes of the Ecumenical Patriarchate, [CDs no 1 – 5], Father Dionysios Phirphires, Protopsaltes of the Protato of Athos (†1990) [CDs no 6 – 7], Bishop Nicodemos Vallendras (†2008) [CD no 8], Mathew Tsamkiranes (†2006), Protopsaltes of Kavala, [CD no 9], Charilaos Taliadoros, Protopsaltes of Thessaloniki (born in 1926) [CD no 10], and Leonidas Spekas (†2000), Protopsaltes of Athens and Chios [CDs no 11 – 14]. There are two or three runs of many Heirmoi and Kratemata by different Chanters. All the recordings took place during the period 1983–1988 (and very few in 1993) [Research & Publications Centre. Athens 2007. ISBN 978-960-8009-32-5]. 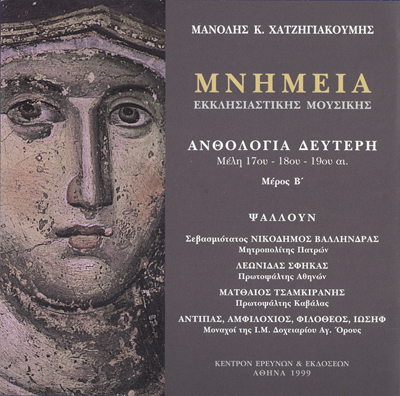 First CD (ΜΚΕ 01). Kalophonic Hermoi (9) by Arsenios the Young, Germanos Neon Patron and Balasios the Priest. Thrasyvoulos Stanitsas is the chanter. Duration 63:33". Second CD (ΜΚΕ 02). Kalophonic Heirmoi (7) by Petros Bereketes (flourished 1680–1715). Part A’, in First Authentic Mode – First Plagal Mode. Thrasyvoulos Stanitsas is the chanter. Duration 76:24". Third CD (ΜΚΕ 03). Kalophonic Heirmoi (8) by Petros Bereketes. Part B’, in First Plagal Mode – Fourth Plagal Mode. 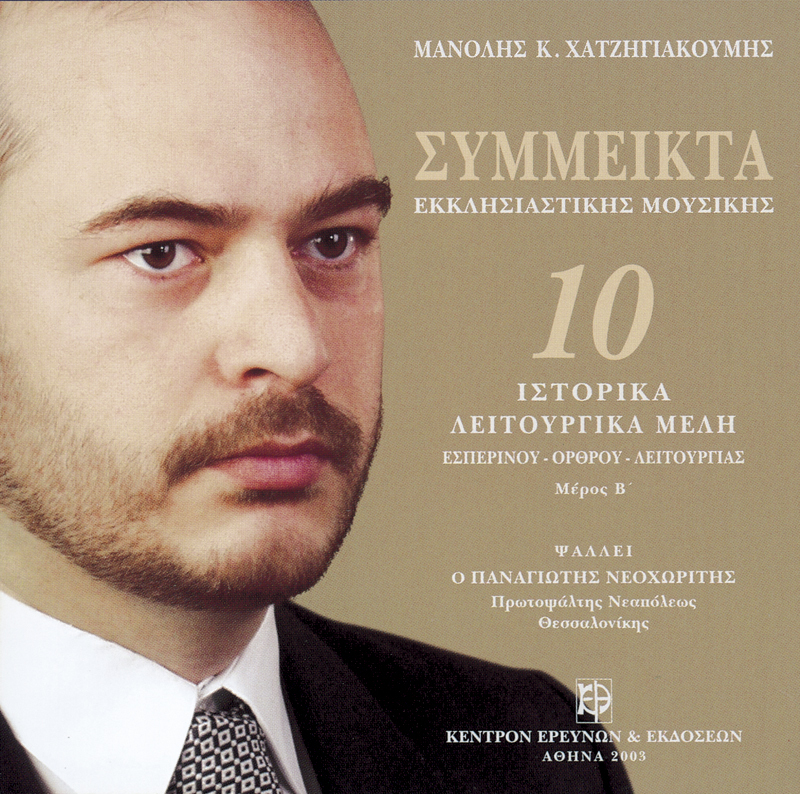 Thrasyvoulos Stanitsas is the chanter. Duration 70:40". Fourth CD (ΜΚΕ 04). Kalophonic Heirmoi (4) by Panayiotis Chalatzoglou, Ioannis Protopsaltes, Daniel Protopsaltes, and Georgios of Crete (18th century). Thrasyvoulos Stanitsas is the chanter. Duration 55:54". Fifth CD (ΜΚΕ 05). Kratemata (9) of Kalophonic Heirmoi (18th–19th centuries). 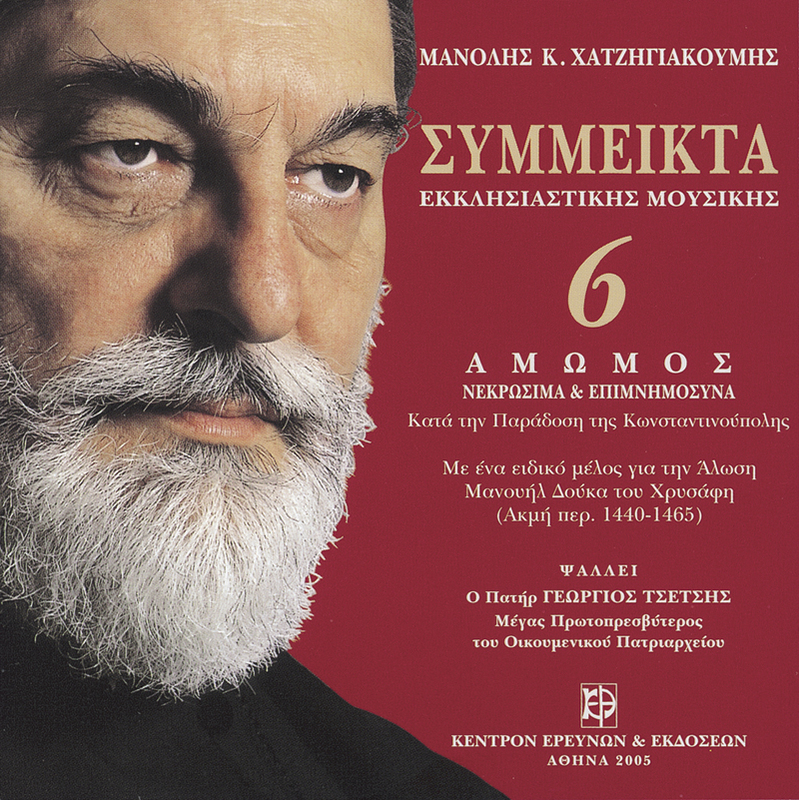 Thrasyvoulos Stanitsas is the chanter. Duration 54:50". Sixth CD (ΜΚΕ 06). Kalophonic Heirmoi (9) by Balasios the Priest, Patriarch Athanasios, Petros Bereketes, Ioannis Protopsaltes, and Petros Peloponnesios (17th–18th centuries). Father Dionysios Phirphires is the chanter. Duration 68:26". 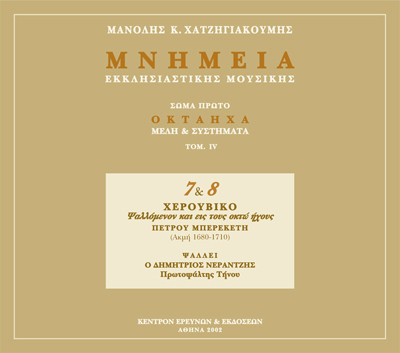 Seventh CD (ΜΚΕ 07). Kalophonic Heirmoi (4) with Kratemata by Nikolaos, Protopsaltes of Smyrna, and Soterios Vlachopoulos (19th century). Father Dionysios Phirphires is the chanter. Duration 50:08". Eighth CD (ΜΚΕ 08). Kalophonic Heirmoi (9) by Germanos Neon Patron, Balasios the Priest, Damianos Vatopedinos, Petros Bereketes, and Meletios Sinaites the Old (17th–early 18th centuries). Bishop Nicodemos Vallendras is the chanter. Duration 70:47". Ninth CD (ΜΚΕ 09). 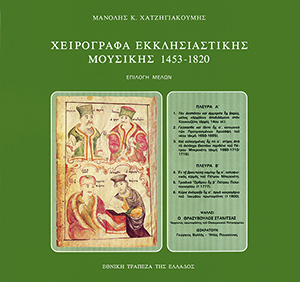 Kalophonic Heirmoi (3) by Petros Bereketes with Kratemata by Ioannis Protopsaltes, Daniel Protopsaltes (with his Kratema) and Chourmouzios Chartophylax (late 17th–early 19th centuries). Matthew Tsamkiranes is the chanter. Duration 56:13". Tenth CD (ΜΚΕ 10). Kalophonic Heirmoi (3) by Petros Bereketes, Daniel Protopsaltes (with his own Kratema) and one Kratema by Chourmouzios Chartophylax (late 17th century, second half of 18th century, first half of 19th century). Charilaos Taliadoros is the chanter. Duration 74:23". Eleventh CD (ΜΚΕ 11). Kalophonic Heirmoi (8) by Germanos Neon Patron, Balasios the Priest, Patriarch Athanasios, and Petros Bereketes (17th century). Leonidas Sphekas is the chanter. Duration 71:35". Twelfth CD (ΜΚΕ 12). Nine (9) Kratemata of Kalophonic Heirmoi by Ioannis Protopsaltes, Petros Peloponnesios, Iakovos Protopsaltes, and Meletios Sinaites the Old (18th century). Leonidas Sphekas is the chanter. Duration 70:27". Thirteenth CD (ΜΚΕ 13). 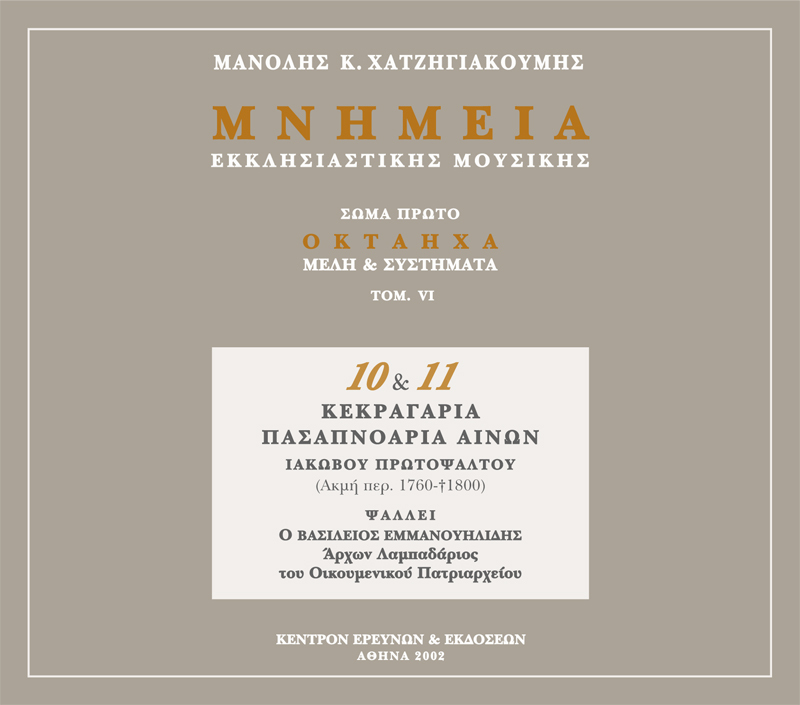 Ten (10) Kratemata of Kalophonic Heirmoi by Daniel Protopsaltes, Petros Peloponnesios, Panayiotis Chalatzoglou, Ioannis Protopsaltes, Georgios of Crete, and Chourmouzios Chartophylax (18th–early 19th centuries). Leonidas Sphekas is the chanter. Duration 72:14". Fourteenth CD (ΜΚΕ 14). Six (6) Kratemata of selected “arga” (=in a slow tempo) Kalophonic Heirmoi by Ioannis Protopsaltes, Petros Peloponnesios, Panayiotis Chalatzoglou, Georgios of Crete, and an Anonymous (18th century). Leonidas Sphekas is the chanter. Duration 62:09". Kalophonic Heirmoi are available only as a Corpus in one box set of 14 CDs (ΜΚΕ 01 ‒ ΜΚΕ 14) with three booklets of 616 pages (Volume 1, Hymns and musical comments, 224 pages; Volume 2, Music Texts, Part A΄, 196 pages; Volume 2, Music Texts, Part B΄, 196 pages). Athens 2007, ISBN 978-960-8009-32-5. Twenty four (24) CDs (ΜΔΙ 01 – ΜΔΙ 24) in two box sets: Part A’, CDs no 1 – 12 with two books: volume A’, History – Recording – Performance – The Composer – Performers – Music Texts [CDs no 1 – 4] (228 pages); volume B’, Music Texts [CDs no 5 – 12] (232 pages). Part B’ CDs 13 – 24 with two more books: volume C’, Music Texts [CDs no 13 – 7] (160 pages), and volume D’, Music Texts [CDs no 18 – 24] (176 pages) [Research & Publications Centre, Athens 2010, ISBN 978-960-8009-33-2]. The third Corpus of the historical and philological Series “Monuments of Ecclesiastical Music” contains only one music form of Hymns, Doxastika by Iakovos, Protopsaltes, (flourished between 1760–†1800) from his well known “Doxastarion” (first edition, Constantinople 1836). These Doxastika are chanted by the brilliant chanter, Father Dionysios Phirphires (†1990), Protopsaltes of the Protato of Athos, in 22 out of 24 CDs (total duration about 24 hours). 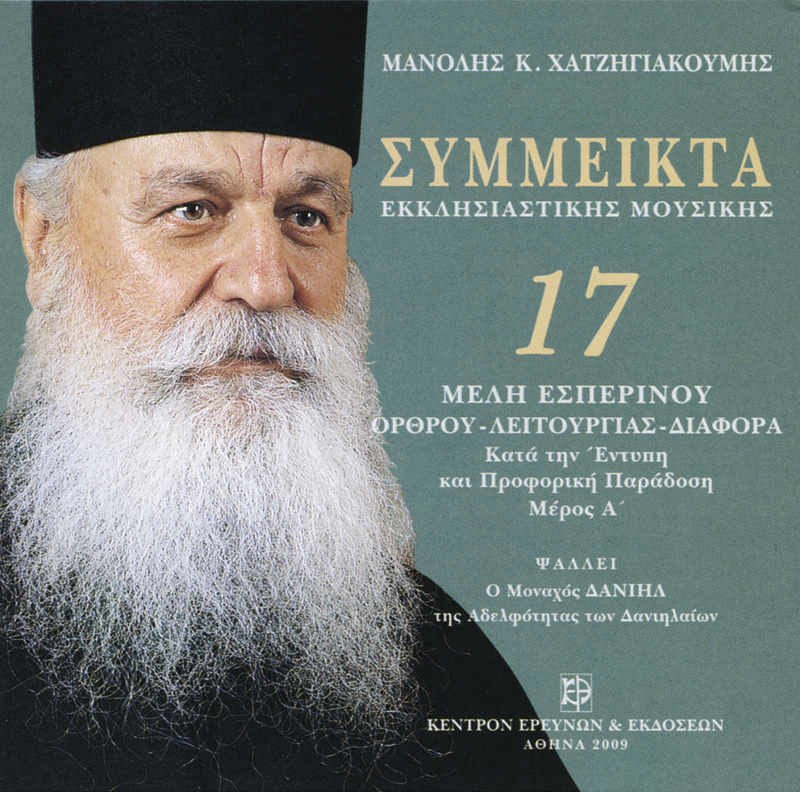 In the last two discs (CDs no 23 –24), Venerable Father Kyprianos (†2007) of the music fraternity of “Thomades” and Bishop Nicodemos Vallendras (†2008) chant Hymns by Iakovos of Mount Athos. The recordings took place during the period 1984–1988. 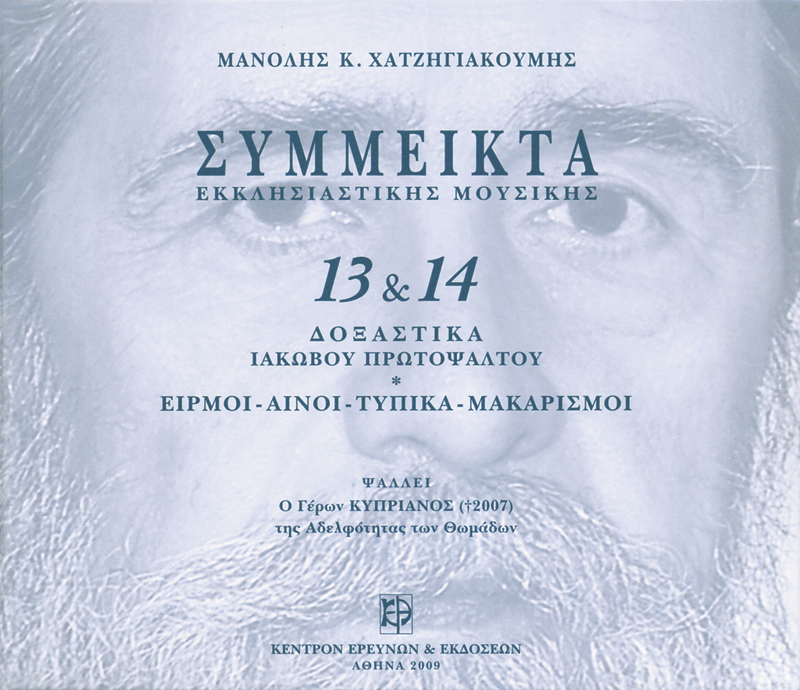 In these (24) digital discs (130) Doxastika and Idiomela by Iakovos are released (121 by Father Dionysios). These sound recordings are very important. First of all, “Doxastarion” by Iakovos is one of the most important ecclesiastical music books of modern times. Actually, it constitutes the historical end of the great Chanting tradition (uninterrupted on Mount Athos) of the Old (Byzantine) Sticherarion. The recordings are important mainly because of the performance of Father Dionysios Phirphires who constitutes the last landmark of this type of performance which incorporates the long living chanting tradition of Sticherarion – Doxastarion on Mount Athos. This recorded performance of Father Dionysios captured for ever an invaluable and integral piece of the great music tradition of Hellenism. First CD (MΔI 01). Doxastika for September (I). Father Dionysios Phirphires, Protopsaltes of the Protato of Athos, is the chanter. Duration 65:19". Second CD (MΔI 02). Doxastika for September (II). Father Dionysios Phirphires, Protopsaltes of the Protato of Athos is the chanter. Duration 69: 50". 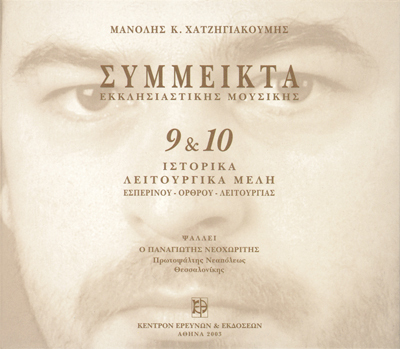 Third CD (MΔI 03). Doxastika for October (I). Father Dionysios Phirphires, Protopsaltes of the Protato of Athos, is the chanter. Duration 71:06". Fourth CD (MΔI 04). Doxastika for November (I). Father Dionysios Phirphires, Protopsaltes of the Protato of Athos, is the chanter. Duration 56:58". Fifth CD (MΔI 05). Doxastika for November (II) – December (I). Father Dionysios Phirphires, Protopsaltes of the Protato of Athos, is the chanter. Duration 58:45". 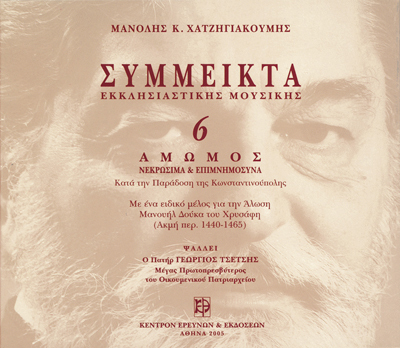 Sixth CD (ΜΔΙ 06). Doxastika for December (II). Father Dionysios Phirphires, Protopsaltes of the Protato of Athos, is the chanter. Duration 64:59". Seventh CD (MΔI 07). Doxastika for December (III). Father Dionysios Phirphires, Protopsaltes of the Protato of Athos, is the chanter. Duration 68: 09". Eighth CD (ΜΔΙ 08). Doxastika for Christmas. Father Dionysios Phirphires, Protopsaltes of the Protato of Athos, is the chanter. Duration 59:39". Ninth CD (MΔΙ 09). Doxastika for Saint Basil the Great – The Hours of the Theophany (I). Father Dionysios Phirphires, Protopsaltes of the Protato of Athos, is the chanter. Duration 59:38". Tenth CD (ΜΔΙ 10). Doxastika for the Hours of the Theophany (2). Father Dionysios Phirphires, Protopsaltes of the Protato of Athos, is the chanter. Duration 58:41". Eleventh CD (ΜΔΙ 11). Doxastika for the Theophany. Father Dionysios Phirphires, Protopsaltes of the Protato of Athos, is the chanter. Duration 68:36". Twelfth CD (ΜΔΙ 12). Doxastika for January (I). Father Dionysios Phirphires, Protopsaltes of the Protato of Athos, is the chanter. Duration 65:29". 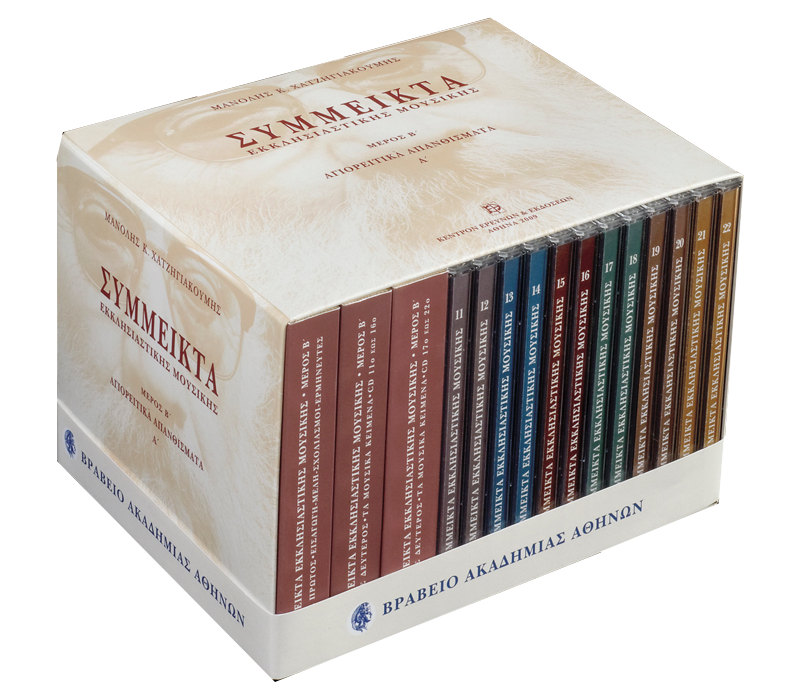 Doxastika by Iakovos Protopsaltes are available in two box sets. 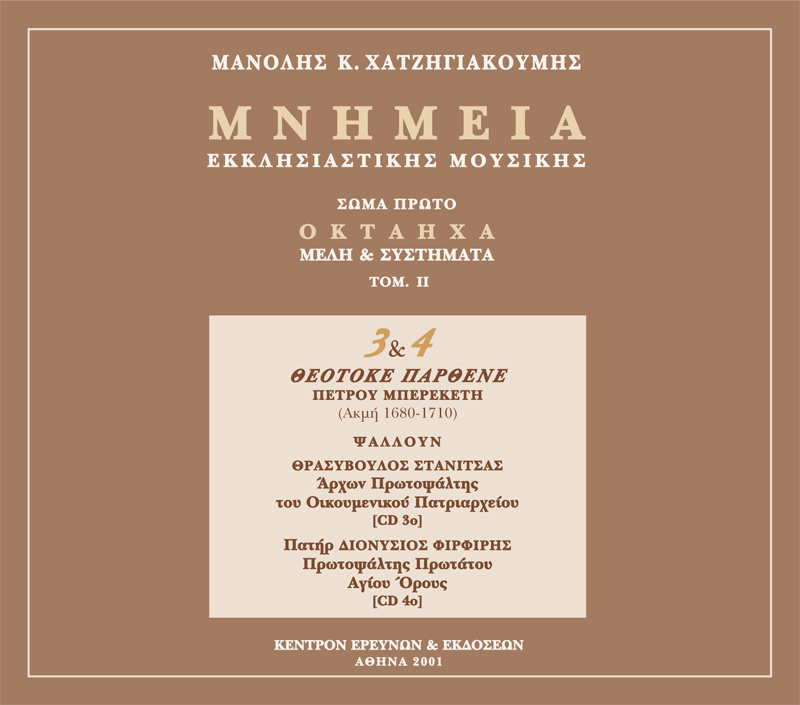 The first one includes CDs no 1 ‒ 12 as Part Aʼ (ΜΔ 01 ‒ ΜΔΙ 12) with two booklets of 450 pages (Volume 1, History ‒ Recording ‒ Performance ‒ The Composer ‒ Performers ‒ Music Texts [CDs no 1 ‒ 4], 224 pages; Volume 2, Music Texts [CDs no 5 ‒ 12], 226 pages). Athens 2010, ISBN 978-960-8009-33-2. Thirteenth CD (ΜΔΙ 13). Doxastika for January (II). Father Dionysios Phirphires, Protopsaltes of the Protato of Athos, is the chanter. Duration 66:15". Fourteenth CD (ΜΔΙ 14). Doxastika for January (III) – February (I). Father Dionysios Phirphires, Protopsaltes of the Protato of Athos, is the chanter. Duration 59:14". Fifteenth CD (ΜΔΙ 15). Doxastika for February (II) – March. Father Dionysios Phirphires, Protopsaltes of the Protato of Athos, is the chanter. Duration 71:14". 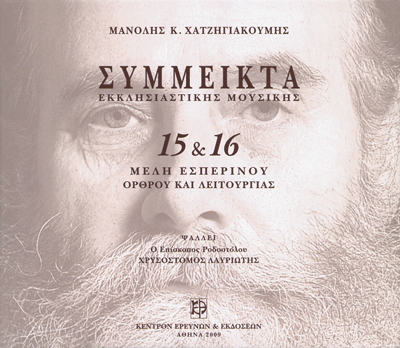 Sixteenth CD (ΜΔΙ 16). Doxastika, second volume. Ecclesiastical Year – Triodion (I). Father Dionysios Phirphires, Protopsaltes of the Protato of Athos, is the chanter. Duration 63:29". Seventeenth CD (ΜΔΙ 17). 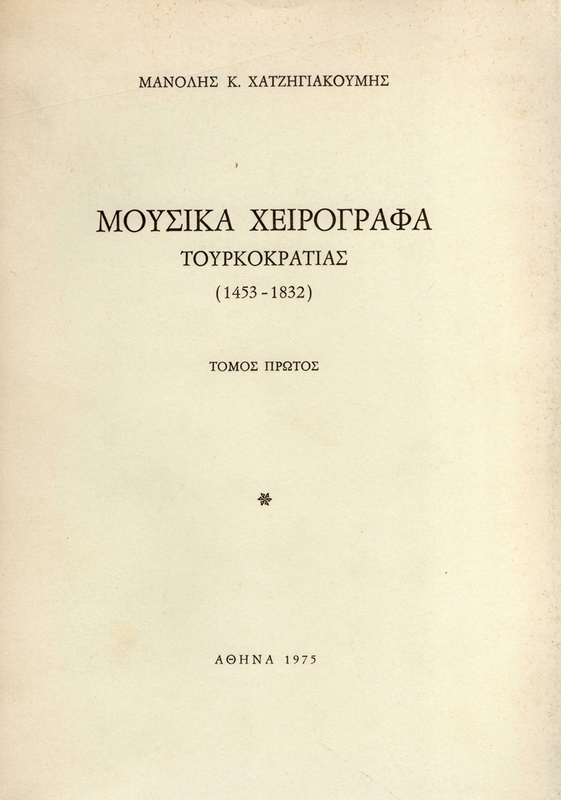 Doxastika, second volume: Triodion (II) – Pentekostarion. Father Dionysios Phirphires, Protopsaltes of the Protato of Athos, is the chanter. Duration 68:12". Eighteenth CD (ΜΔΙ 18). Dogmatic Theotokia. Father Dionysios Phirphires, Protopsaltes of the Protato of Athos, is the chanter. Duration 70:44". 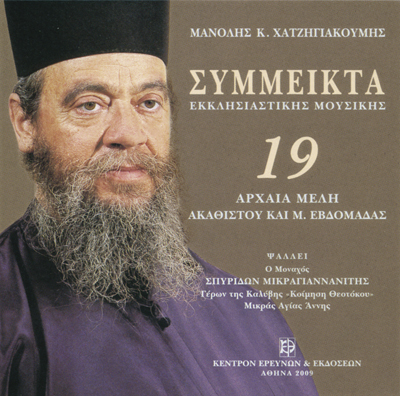 Nineteenth CD (ΜΔΙ 19). Doxastika outside the Series (I). Father Dionysios Phirphires, Protopsaltes of the Protato of Athos, is the chanter. Duration 62:37". 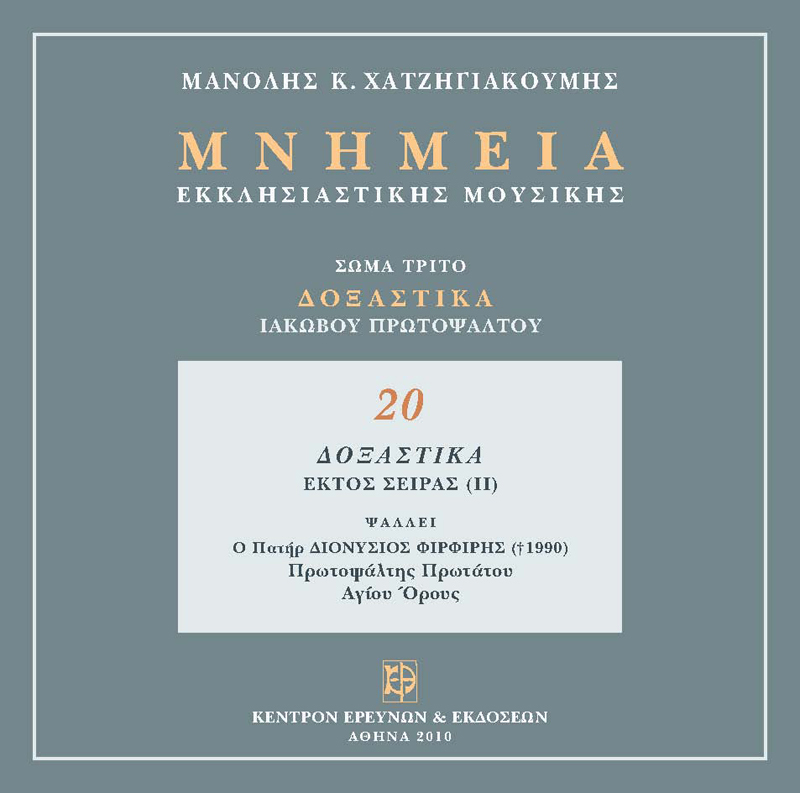 Twenty CD (ΜΔΙ 20). Doxastika outside the Series (II). Father Dionysios Phirphires, Protopsaltes of the Protato of Athos, is the chanter. Duration 78:16". 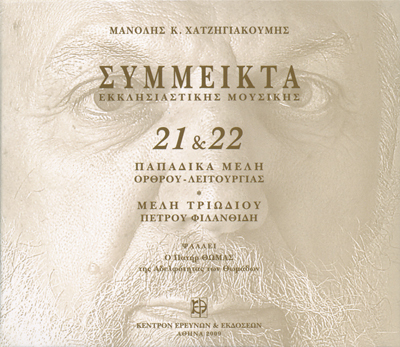 Twenty First CD (ΜΔΙ 21). Doxastika, first run .(I). Father Dionysios Phirphires, Protopsaltes of the Protato of Athos, is the chanter. Duration 71:19". Twenty Second CD	(ΜΔΙ 22). Doxastika, first run (II) – Doxastika by Petros Philanthides. Father Dionysios Phirphires, Protopsaltes of the Protato of Athos, is the chanter. Duration 70:43". Twenty Third CD (ΜΔΙ 23). Doxastika for April – May. Venerable Father Kyprianos of the fraternity of “Thomades” of Athos, is the chanter. Duration 67:20". Twenty Fourth CD (ΜΔΙ 24). Idiomela for Lent Sunday. Bishop Nicodemos Vallendras, is the chanter. Duration 52:46". 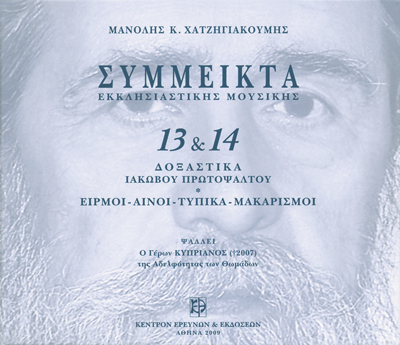 Doxastika by Iakovos Protopsaltes in the second box set includes CDs no 13 ‒ 24 as Part B’ (ΜΔΙ 13 ‒ ΜΔΙ 24) with two booklets of 326 pages (Volume 3, Music Texts [CDs no 13 ‒ 17], 154 pages; Volume 4, Music Texts [CDs no 18 ‒ 24], 172 pages]. Athens 2010, ISBN 978-960-80009-33-2. 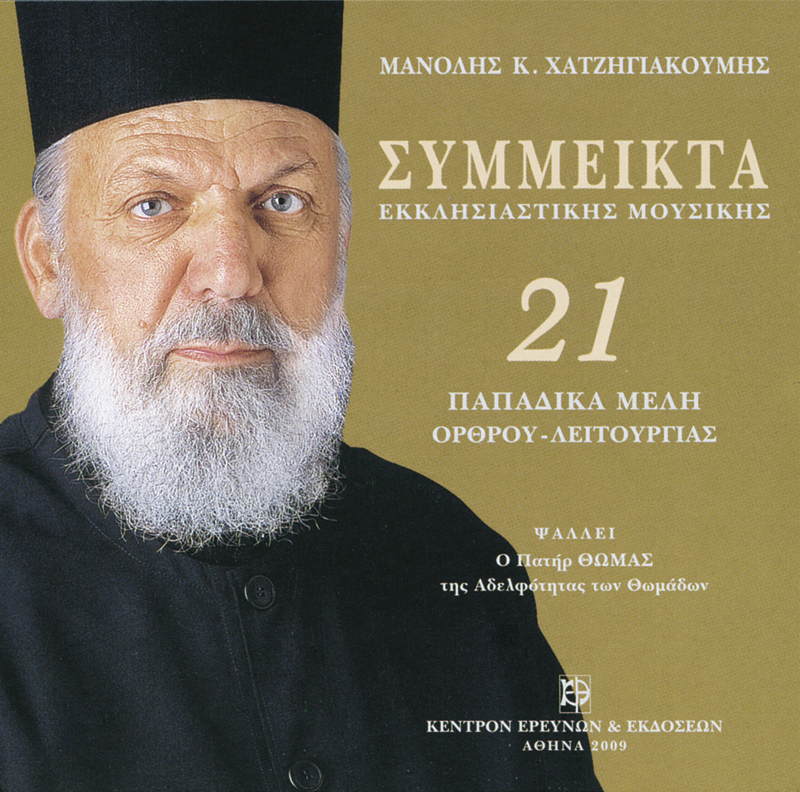 Twenty three (23) Doxastika, the most wonderful in terms of performance and composition, have been selected from the above mentioned Hymns and particularly from the content of CDs no 1 – 22, chanted by Father Dionysios Phirphires. 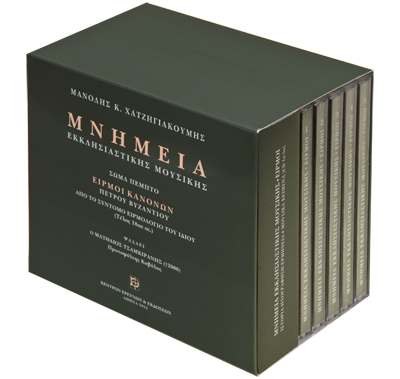 They have been released individually in a small box set of 4 CDs (ΜΔΙ ΕΟ1 – ΜΔΙ ΕΟ4) with a 192 page booklet, with all the necessary historical, philological, musical comments and the corresponding Byzantine music texts [Research & Publications Centre, Athens 2010, ISBN 978-960-8009-34-9]. 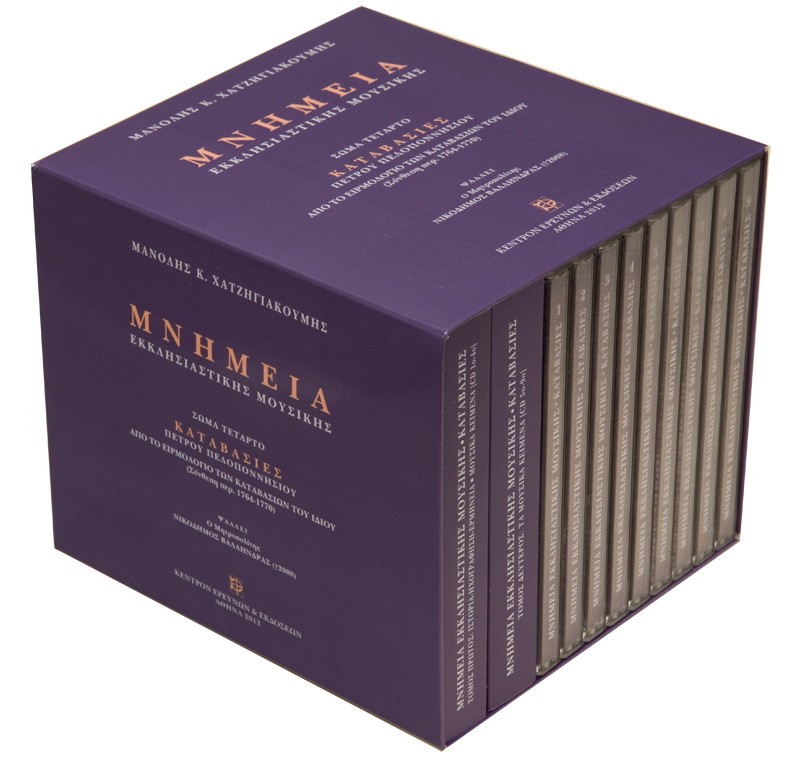 Nine (9) CDs (ΜΚΠ 01 – ΜΚΠ 09) in a single box set with two booklets: volume A’, History – Recording – Performance – Τhe Composer – Τhe Performer – Music Texts [CDs no 1 – 4] (228 pages); volume B’, Music Texts [CDs no 5 – 9] (246 pages). This Corpus contains only Katavasies “arga” (=in a slow tempo) by Petros Peloponnesios (†1777) from his music book “Heirmologion of Katavasies” (composed between 1764 and 1770, first edition Constantinople 1825). All these Katavasies are performed by the same performer and chanter, Bishop Nicodemos Vallendras (†2008). The recording of “Heirmologion” took place in 1990–1991. T by Petros Peloponnesios and the supplements of Petros Byzantios, Gregorios Protopsaltes, and Editor Chourmouzios Chartophylax. Thus, these discs include: 13 Kanons by Petros Peloponnesios, 4 by Petros Byzantios and 1 by Gregorios Protopsaltes (144 Katavasies in total, CDs no 1 – 4); also the Hymns composed later by Petros Peloponnesios, the Kanons for the Holy Week (Heirmoi and Troparia, CDs no 5 – 6), Eight-Mode Prosomoia (CD no 7), Eight-Mode Kathismata and Antiphona for Sundays in Legetos Mode and First Plagal Mode (CD no 8), and finally Exaposteilaria and Katavasies by Chourmouzios Chartophylax which are chanted “instead of the Axion Estin” (CD no 9). Bishop Nicodemos Vallendras’ performance of the Heirmologion by Petros Peloponnesios constitutes a unique, historical, chanting and performative heritage. 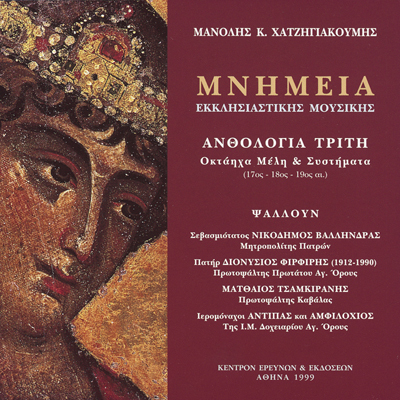 An entire music book (296 pages), one of the most important and most expressive books in the history of Orthodox Ecclesiastical music, rooted in ancient music tradition, was recorded and performed by the most important contemporary performers and chanters (who passed away) [Research & Publications Centre, Athens 2012, ISBN 978-960-8009-38-7]. 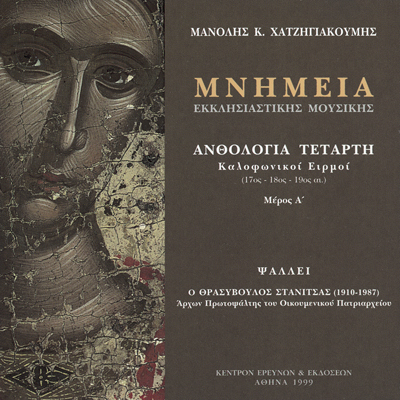 First CD (ΜΚΠ 01). Katavasies in First Mode (I). Bishop Nicodemos Vallendras is the chanter. The disc contains 4 Kanons (32 Katavasies). Duration 62:24". Second CD (ΜΚΠ 02). Katavasies in First Mode (II). Katavasies in Second and Third Modes. Bishop Nicodemos Vallendras is the chanter. The disc contains 4 Kanons (35 Katavasies). Duration 55:51". 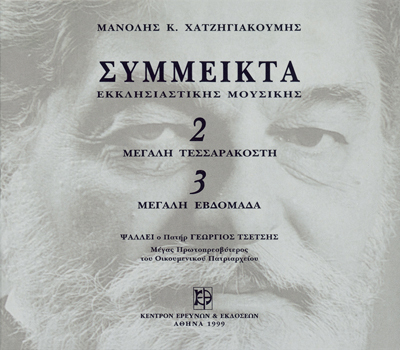 Third CD (ΜΚΠ 03). Katavasies in Legetos Mode, First Plagal Mode and Second Plagal Mode. Bishop Nicodemos Vallendras is the chanter. The disc contains 6 Kanons (51 Katavasies). Duration 68:55". Fourth CD (ΜΚΠ 04). Katavasies in Barys Mode and Fourth Plagal Mode. Bishop Nicodemos Vallendras is the chanter. The disc contains 4 Kanons (31 Katavasies). Duration 51:22". Fifth CD (ΜΚΠ 05). Kanons for the Holy Week. Bishop Nicodemos Vallendras is the chanter. The disc contains 4 Kanons (for Holy Monday, Holy Wednesday, Holy Thursday). Duration 73:20". Sixth CD (MΚΠ 06). Kanon and Eulogetaria for Holy Saturday. Bishop Nicodemos Vallendras is the chanter. Duration 60:54". 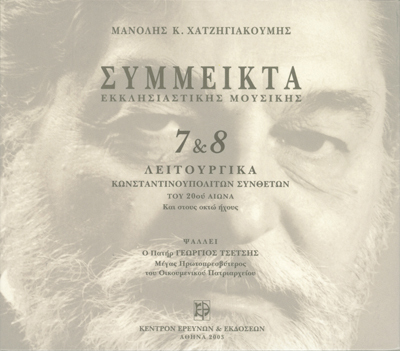 Seventh CD (ΜΚΠ 07). Eight-Μode Prosomoia. Bishop Nicodemos Vallendras is the chanter. Duration 52:07". Eighth CD (ΜΚΠ 08). Eight-Mode Kathismata, Antiphona in Legetos Mode and Plagal Mode. Bishop Nicodemos Vallendras is the chanter. Duration 66:34". Ninth CD (ΜΚΠ 09). Exaposteilaria – Katavasies by Chourmouzios Chartophylax. Bishop Nicodemos Vallendras is the chanter. Duration 61:54". 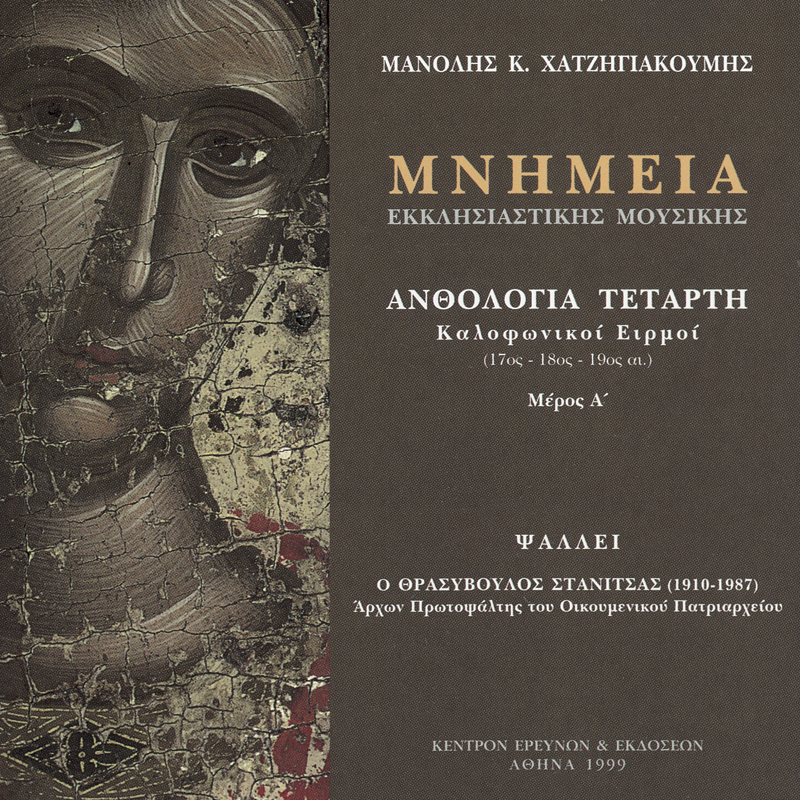 Katavasies by Petros Peloponnesios and Kalophonic Heirmoi and Doxastika by Iakovos are available, only as a Corpus in a single box set with two booklets of 476 pages (Volume 1, History ‒ Recording ‒ Performance ‒ The Composer ‒ The Performer ‒ Music Texts [CDs no 1 ‒ 4], 228 pages; Volume 2, Music Texts [CDs 5 ‒ 9], 248 pages). Athens 2012, ISBN 978-960-8009-38-7. 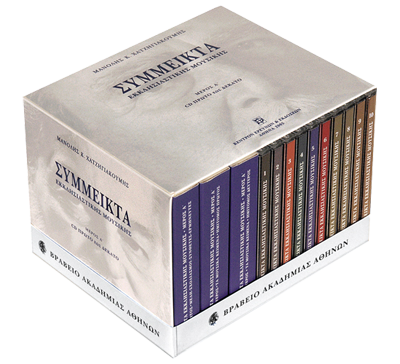 Five (5) CDs (ΜΕΒ 01 – ΜΕΒ 05) in a single small box set with one booklet: History – Recording – Performance – The Composer – The Performer. Music Texts [CDs no 1 – 5] (348 pages). This Corpus includes Kanons and other Hymns from “Syntomon Heirmologion” by Petros Byzantios (composed in late 18th century, the first dated manuscript in 1803). Matthew Tsamkiranes (†2006), Protopsaltes of Kavala, chants all the Hymns with his mellifluous voice. The recording took place in 1992. The Corpus consists of five (5) digital discs (CDs) which contain the entire content of the first edition (Constantinople 1825) of “Syntomon Heirmologion” by Petros Byzantios. In these discs, 43 Eight-Mode Kanons for the Ecclesiastical Year, Triodion and Pentekostarion (344 Heirmoi in total, CDs no 1 – 4), as well as Eight-Mode Prosomoia, Eight-Mode Kathismata, Easter Prosomoia, and Amomos (CD no 5) are included. 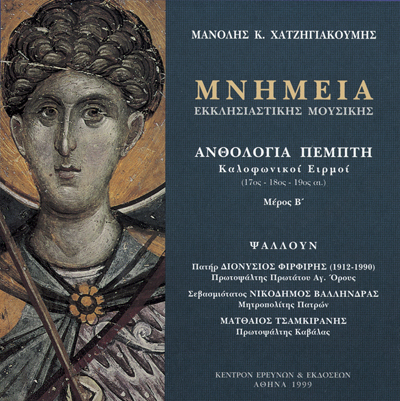 All these Hymns were composed by Petros Byzantios. Matthew Tsamkiranes’ performance is extremely interesting. It is an excellent performance of Kanons which are very interesting quick tempo syllabic melos, particularly the old eponymous version by Petros Byzantios. In this case too, a whole music book, “Syntomon Heirmologion” by Petros Byzantios (185 pages), is recorded and performed in an authentic and pure style by a brilliant mellifluous chanter of the older generation (who passed away). 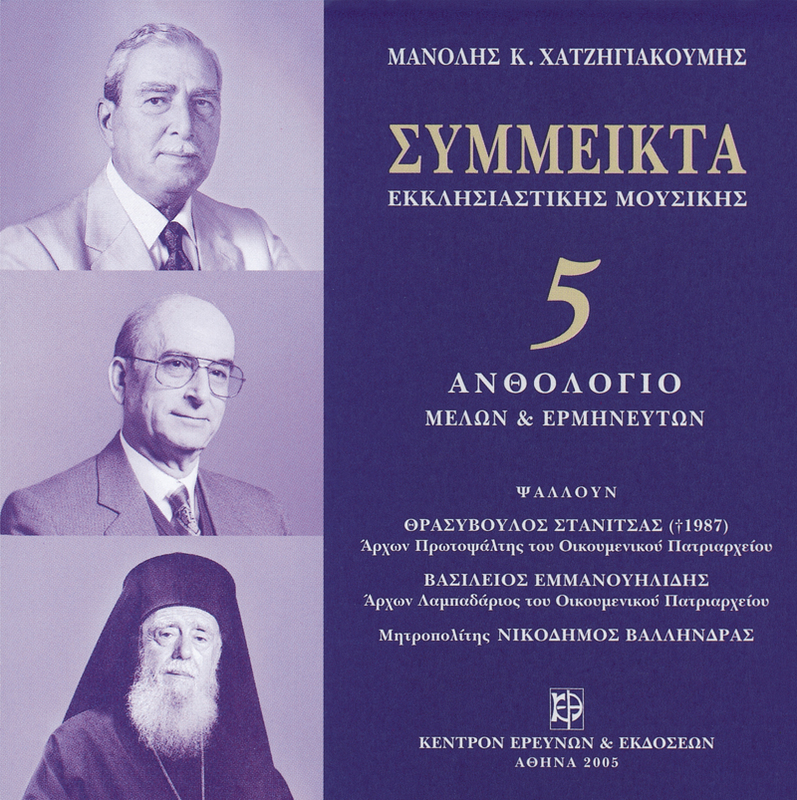 In this respect, Corpus Four is as important as Heirmologion of Katavasies by Petros Peloponnesios. Both these innovative music books renewed the older music material. These recorded performances provide an opportunity for important historical expressions of the artistic music tradition of Modern Hellenism to become widely known [Research & Publications Centre, Athens 2012. ISBN 978-960-8009-39-4]. First CD (ΜΕΒ 01). First-Mode Heirmoi. Matthew Tsamkiranes is the chanter. The disc includes nine (9) abridged Kanons (56 Heirmoi). Duration 55:18". Second CD (ΜΕΒ 02). Heirmoi in Second Authentic Mode and Third Authentic Mode. Matthew Tsamkiranes is the chanter. The disc contains 12 abridged Kanons (78 Heirmoi). Duration 55:33". 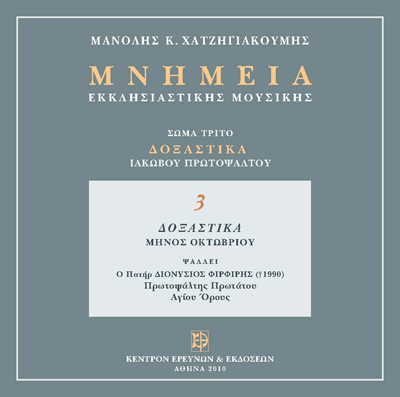 Third CD (ΜΕΒ 03). Heirmoi in Legetos and First Plagal Modes. Matthew Tsamkiranes is the chanter. The disc includes 10 abridged Kanons (80 Heirmoi). Duration 57:43". 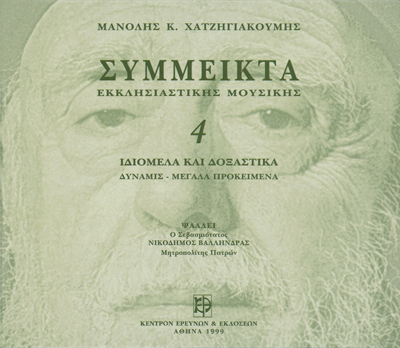 Fourth CD (ΜΕΒ 04). Heirmoi in Second Authentic Mode, Barys Mode and Fourth Plagal Mode. Matthew Tsamkiranes is the chanter. The disc includes 13 abridged Kanons (95 Heirmoi). Duration 65:58". 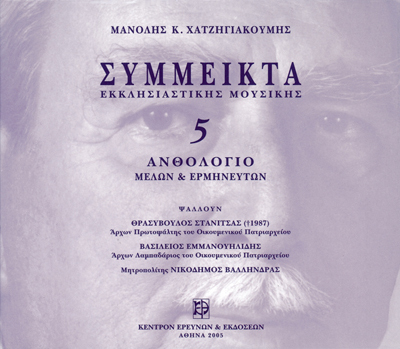 Fifth CD (ΜΕΒ 05). Eight-Mode Prosomoia – Eight-Mode Kathismata –Easter Prosomoia – Amomos. Matthew Tsamkiranes is the chanter. The disc contains 67 Hymns in total. Duration 66:17". 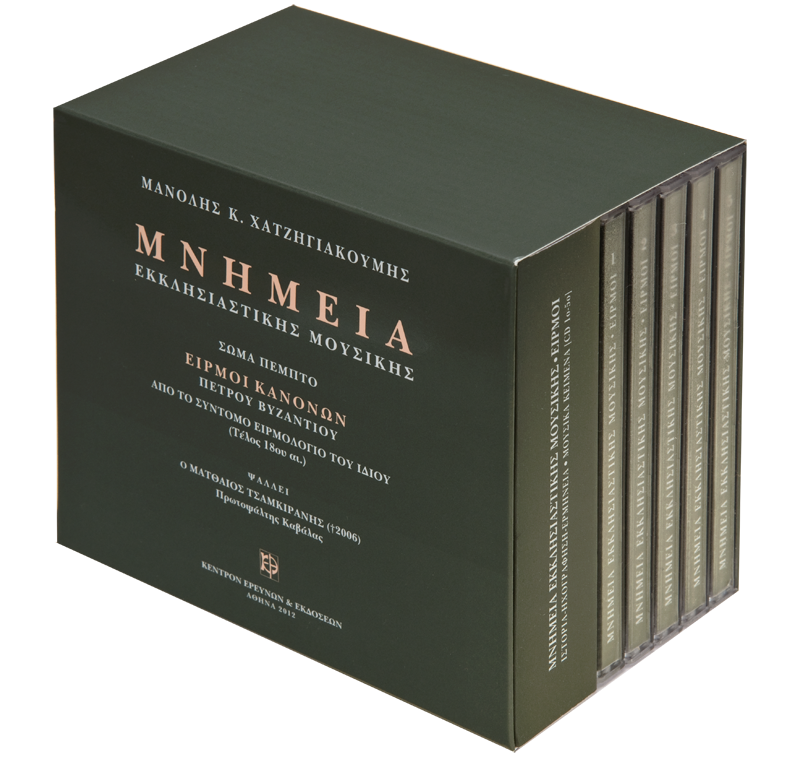 The Fifth Corpus is available in a single box set of five (5) disks [CDs no 1 ‒ 5] with one booklet of 350 pages (in which all the recording contributors, “Syntomon Heirmologion” by Petros Byzantios, the Contents and the data of the disks concerning the Music texts are included). Athens 2012, ISBN 978-960-8009-39-4. 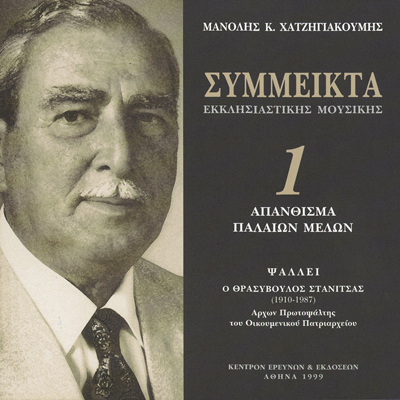 First CD (ΣΟ 01) [Volume 1]. This disc contains the “Anthology of Old Hymns” (14th–18th century). 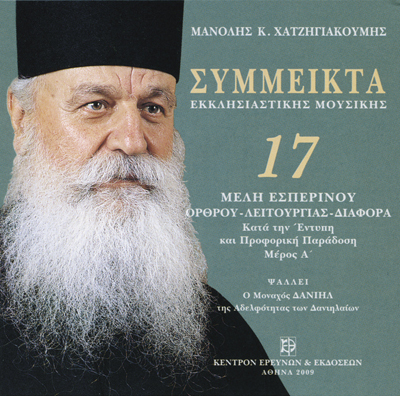 Thrasyvoulos Stanitsas, Archon Protopsaltes of the Ecumenical Patriarchate, is the chanter keeping the style and tradition of the Great Church of Christ (Recording of 1980). Digital edition – with the addition of more Hymns – of the LP accompanying the Book Cheirografa Ecclesiastikis Mousikis 1453–1820 (by Manolis K. Chatzegiakumes, Athens 1980, a publication of the National Bank of Greece). 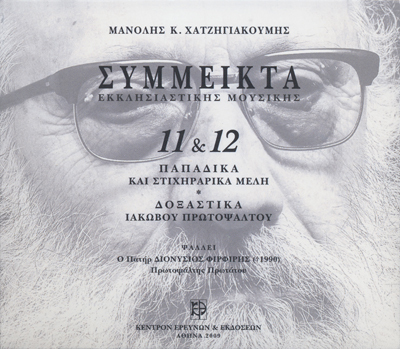 One (1) CD with a 70 page booklet [Research & Publications Centre, Athens 1999]. Second and Third CDs (ΣΟ 02 – ΣΟ 03) [Volume 2]. They include a collection of Hymns from “Great Lent” and “Holy Week”. Father Georgios Tsetses, Great Head Priest of the Ecumenical Patriarchate, is the chanter keeping the style and tradition of the Great Church of Christ. Set of two (2) CDs with a 152 page booklet [Research & Publications Centre, Athens 1999]. 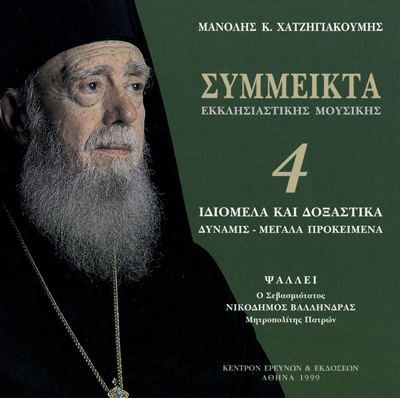 Fourth CD (ΣΟ 04) [Volume 3]. 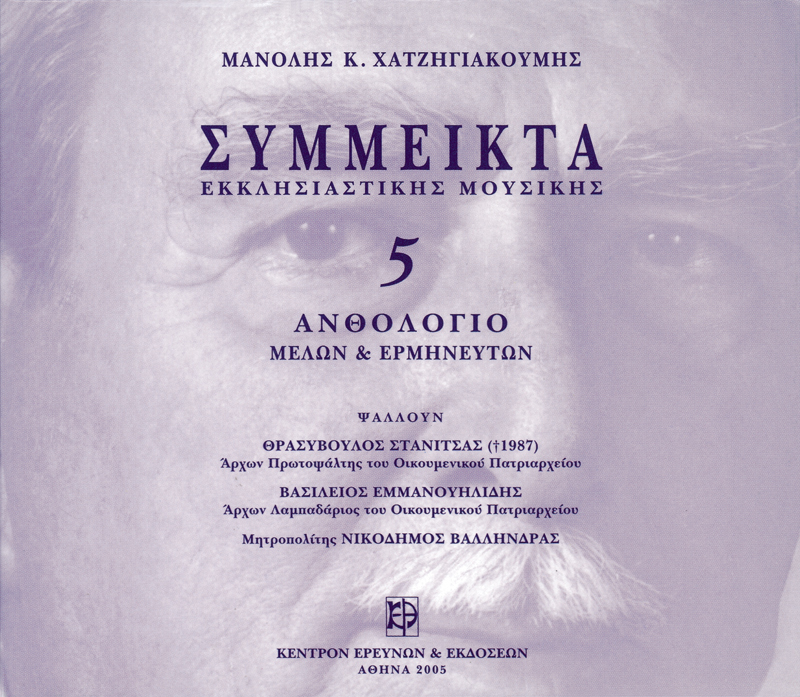 This disc includes “Idiomela – Doxastika – Dynamis – Megala Prokeimena”. Most Reverend Bishop Nicodemos Vallendras is the chanter. Many of Idiomela and Doxastika were composed by him. 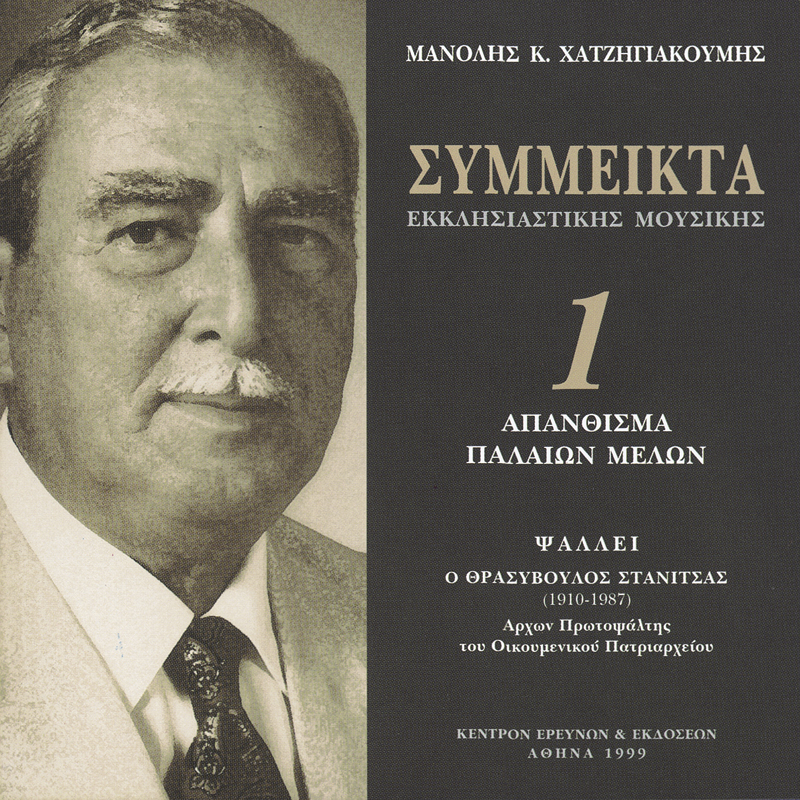 One (1) CD with a 70 page booklet [Research & Publications Centre, Athens 1999]. Fifth CD (ΣΟ 05) [Volume 4]. 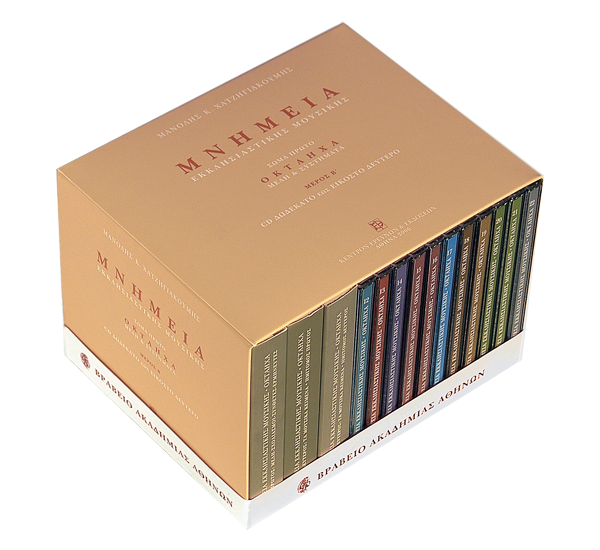 This disc contains the “Music Anthology of Hymns and Performers”. 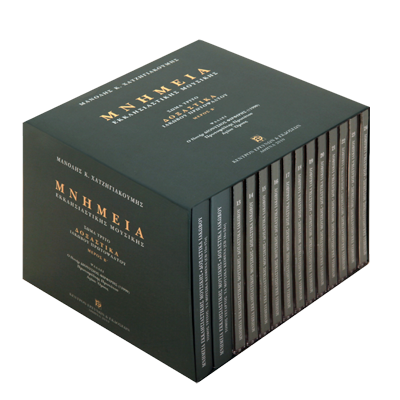 Historical and other Hymns (remains of historical recordings) are included. Thrasyvoulos Stanitsas, Archon Protopsaltes of the Ecumenical Patriarchate, Vasileios Emmanouelides, Archon Lampadarios, and Bishop Nicodemos Vallendras are the chanters. One (1) CD with a 104 page booklet [Research & Publications Centre, Athens 2005]. 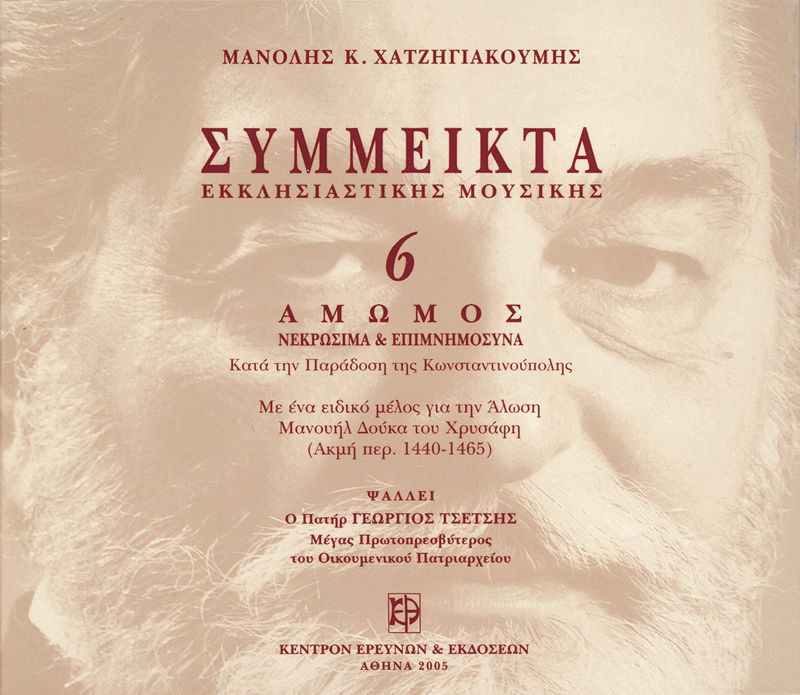 Sixth CD (ΣΟ 06) [Volume 5]. “Amomos. Funeral and Memorial”. Father Georgios Tsetses, Great Head Priest of the Ecumenical Patriarchate is the chanter keeping the tradition of Constantinople. 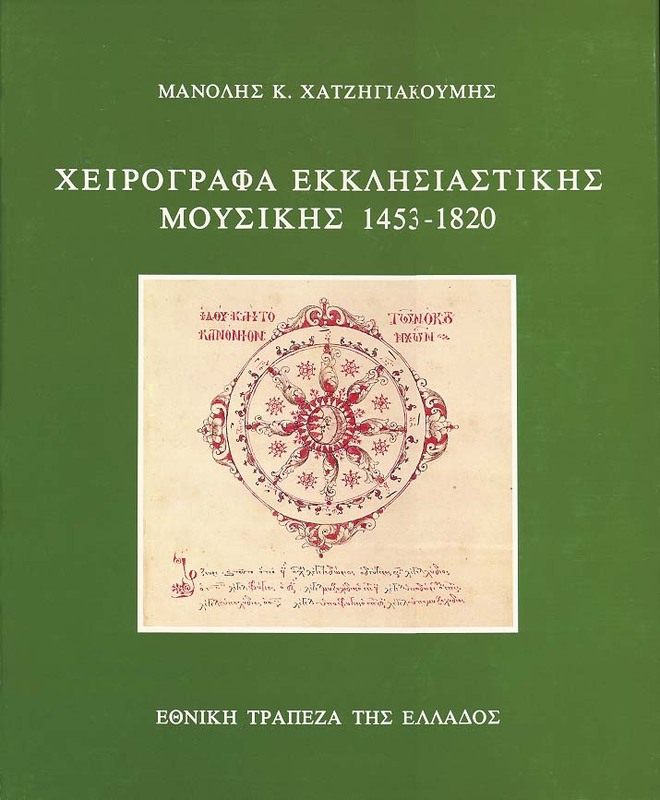 It includes a special Hymn for the Fall of Constantinople (1453) by Manouel Doukas of Chrysaphes (flourished between 1440 and 1465). 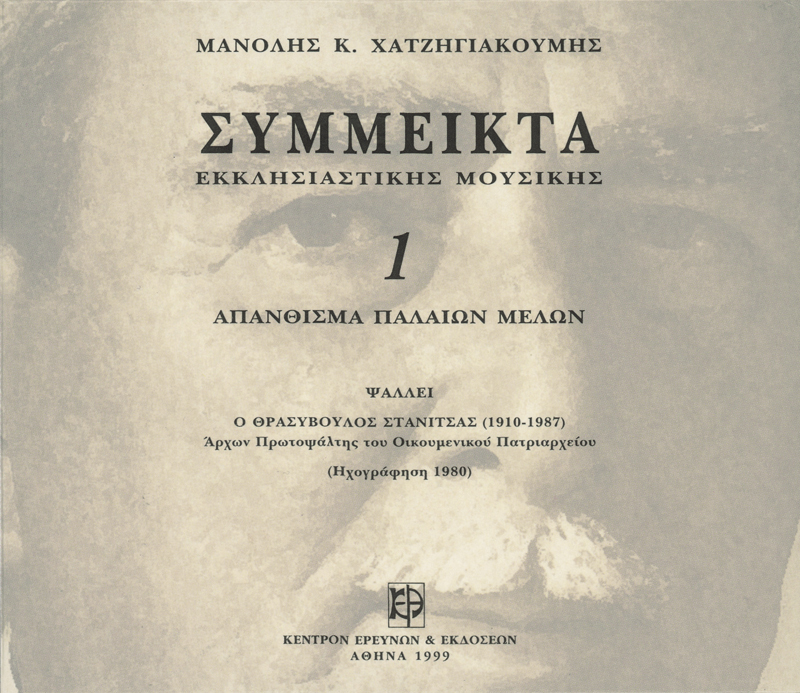 One (1) CD with a 102 page booklet [Research & Publications Centre, Athens 2005]. Seventh and Eighth CDs (ΣΟ 07 – ΣΟ 08) [Volume 6]. 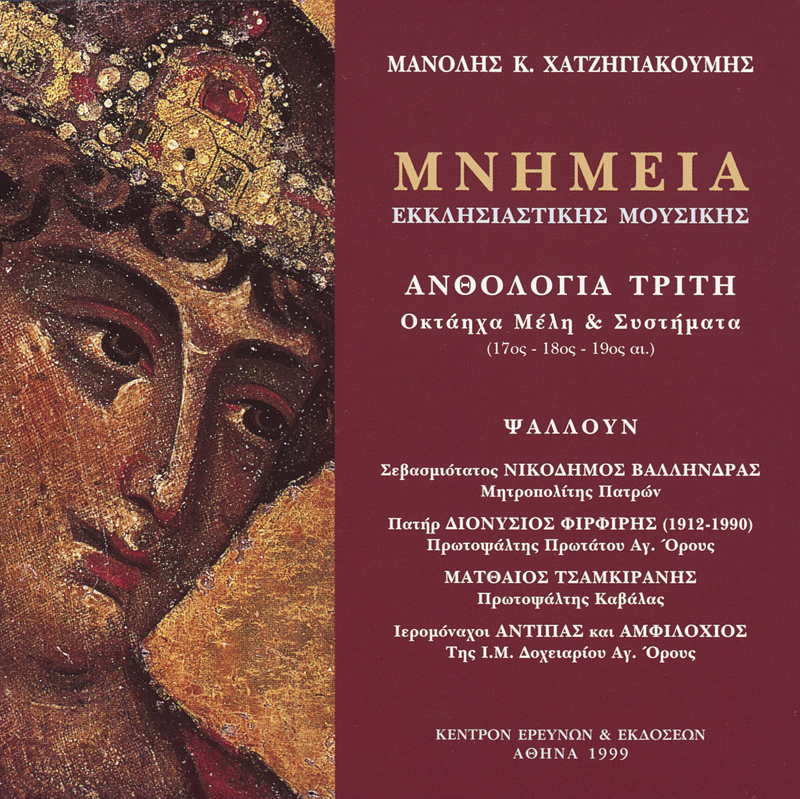 Liturgical Hymns of Constantinopolitan composers of the 20th century. Father Georgios Tsetses, Great Head Priest of the Ecumenical Patriarchate, is the chanter. 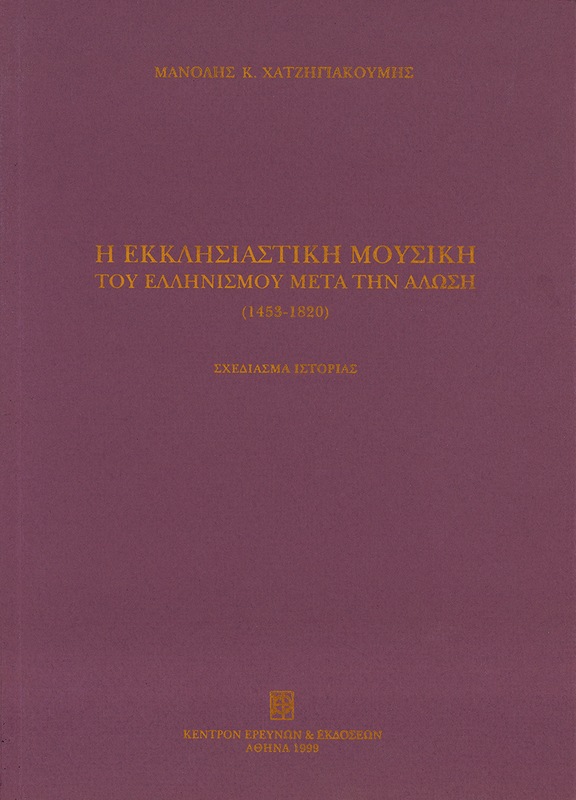 Set of two (2) CDs with a 180 page booklet [Research & Publications Centre, Athens 2003]. Ninth and Tenth CDs (ΣΟ 09 – ΣΟ 10) [Volume 7]. “Historical Liturgical Hymns (Vespers – Matins – Liturgy)”. Panayiotis Neochorites, Protopsaltes Neapoleos of Thessaloniki, is the chanter. Set of two (2) CDs with a 152 page booklet [Research & Publications Centre, Athens 2003]. Twelve (12) CDs (ΣΟ 11 – ΣΟ 22). 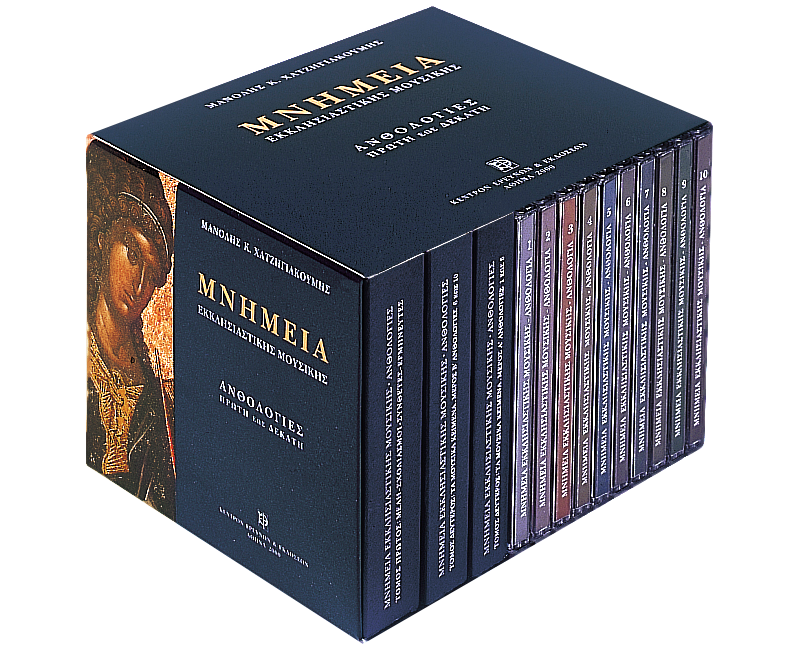 They include exclusively Athos Chanters of the older generation, and Hymns of Athos in a single individual box set titled “Anthology of Athos A’” (Agioritika Apanthismata A’) with three booklets: volume A’, Historical Introduction [to “Ecclesiastical Music on Mount Athos from the Fall of Constantinople to the 20th century”] – Hymns and Comments – Performers (228 pages); volumes B1 and B2, Music Texts (212 and 266 pages respectively). These recordings took place in two different periods: an older period (1984–1989) to which the first three discs belong (11th, 12th, 13th) and a later period (2001–2007) to which the remaining discs belong (14th – 22th). In these twelve digital discs, Father Dionysios Phirphires (†1990), Protopsaltes of the Protato of Athos (CDs no 11 – 12), Reverend Father Kyprianos (†2007) of the music Fraternity of “Thomades” (CDs 13th – 14th), Reverend Father Chrysostomos Lavriotes, Bishop of Rodostolos (CDs 15th – 16th), Daniel and Akakios, Monks of the fraternity of “Danieleon” (CDs 17th – 18th), Monk Spyridon Mikragiannites, Reverend Father of the skete “Assumption of the Virgin”, of Saint Anna Minor (CDs 19th – 20th), and Father Thomas of the fraternity of “Thomades” (CDs 21st – 22nd), are the chanters. 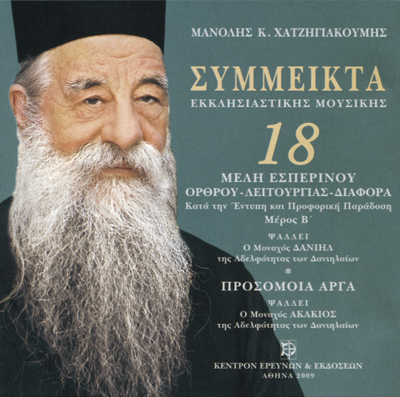 They are the most important contemporary musicians and chanters of Athos (Father Dionysios and Reverend Father Kyprianos passed away). All of them chant with an unrivalled style – pure, authentic and experiential. 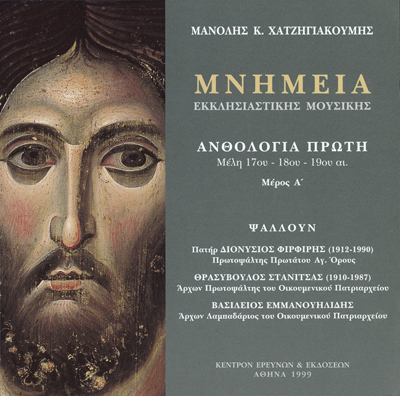 The Hymns in the discs reflect the contemporary, authentic, living chanting tradition of Mount Athos. 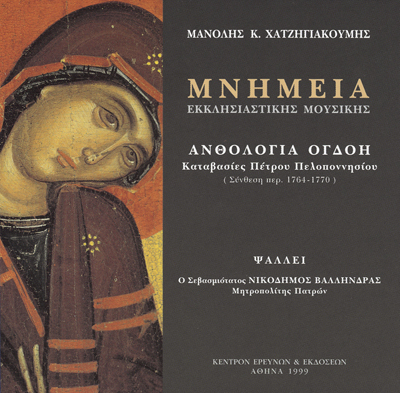 In this respect, this Corpus of Athos Chanters and Hymns constitutes a unique music source of the great chanting tradition of Athos, reflecting its entire historical course and current reality [Research & Publications Centre, Athens 2009. ISBN 978-960-8009-36-3]. Eleventh CD (ΣΟ 11). Hymns of Papadike and Sticherarion. Father Dionysios Phirphires is the chanter. The disc contains 7 Hymns (5 “arga” (=in a slow tempo) of Papadike and 2 Sticheraric). Duration 78:24". Twelfth CD (ΣΟ 12). Doxastika by Iakovos Protopsaltes (†1800). Father Dionysios Phirphires is the chanter. 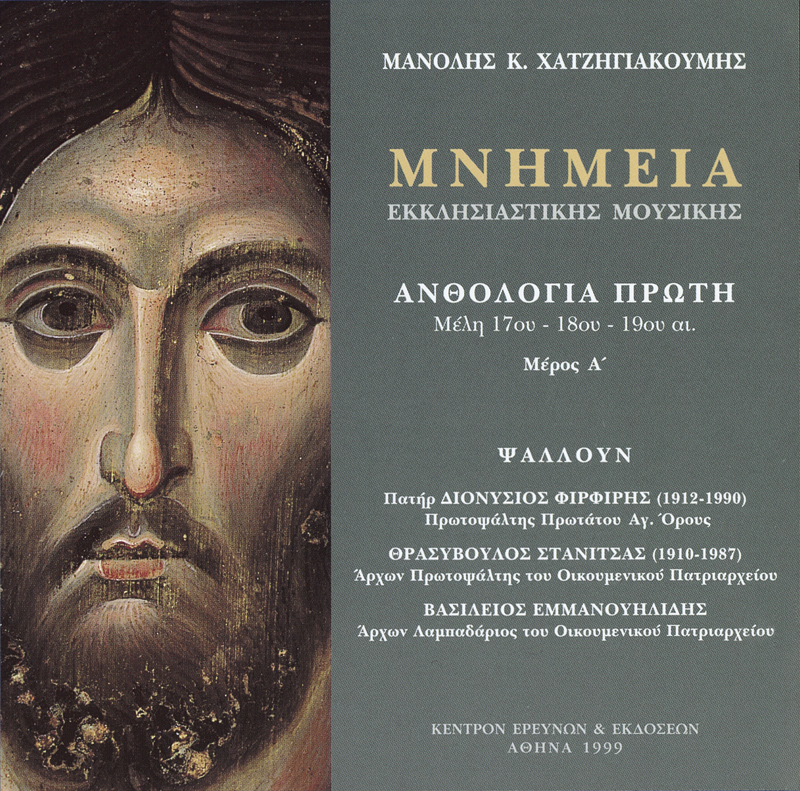 The disc includes 8 Doxastika all of which were chanted by him on special feasts and festivities of the Monasteries of Mount Athos. Duration 72:06". Thirteenth CD (ΣΟ 13). Doxastika by Iakovos Protopsaltes [Part B’]. Reverend Father Kyprianos of the fraternity of “Thomades” is the chanter. The disc includes 7 Doxastika. Duration 67:21". Fourteenth CD (ΣΟ 14). Heirmoi – Ainoi – Typika – Makarismoi (keeping the oral tradition). 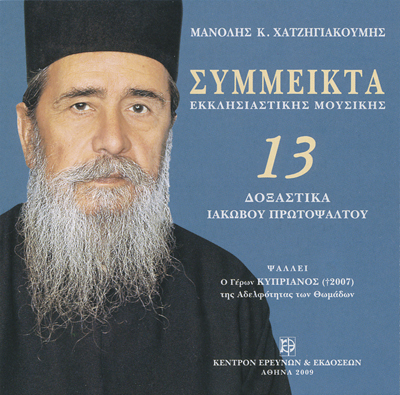 Reverend Father Kyprianos of the fraternity of “Thomades”, is the chanter. Duration 72:43". Fifteenth CD (ΣΟ 15). Hymns for Vespers – Matins – Liturgy. Keeping the written and oral music tradition. Part A’. Chrysostomos Lavriotes, Bishop of Rodostolos, is the chanter. Duration 67:04". Sixteenth CD (ΣΟ 16). Hymns for Vespers – Matins – Liturgy. Keeping the written and oral music tradition. Part B’. Chrysostomos Lavriotes, Bishop of Rodostolos is the chanter. Duration 62:04". 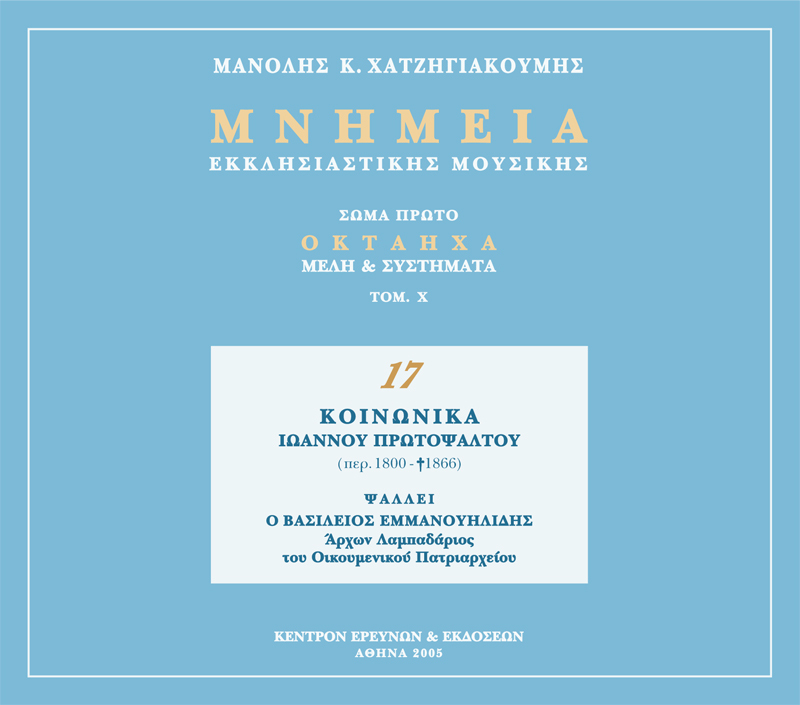 Seventeenth CD (ΣΟ 17). Hymns for Vespers – Matins – Liturgy – Miscellaneous. Keeping the written and oral music tradition. Part A’. Monk Daniel of the fraternity of “Danieleon” is the chanter. Duration 73:29". Eighteenth CD (ΣΟ 18). Hymns for Vespers – Matins – Liturgy –Miscellaneous. Keeping the written and oral music tradition. Part B’. Monk Daniel of the fraternity of “Danieleon”. “Arga” (=in a slow tempo) Prosomoia. Monk Akakios of the fraternity of “Danieleon” is the chanter. Duration 76:36". Nineteenth CD (ΣΟ 19). 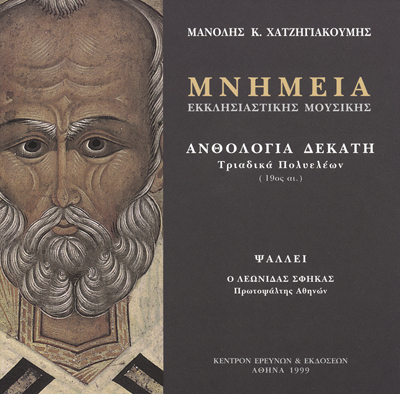 Ancient Akathistos Hymn and Hymns for the Holy Week. Monk Spyridon Mikragiannanites is the chanter. Duration 56:31". 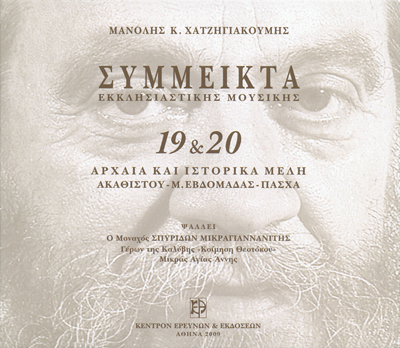 Twentieth CD (ΣΟ 20). Historical Hymns for the Holy Week and Easter. 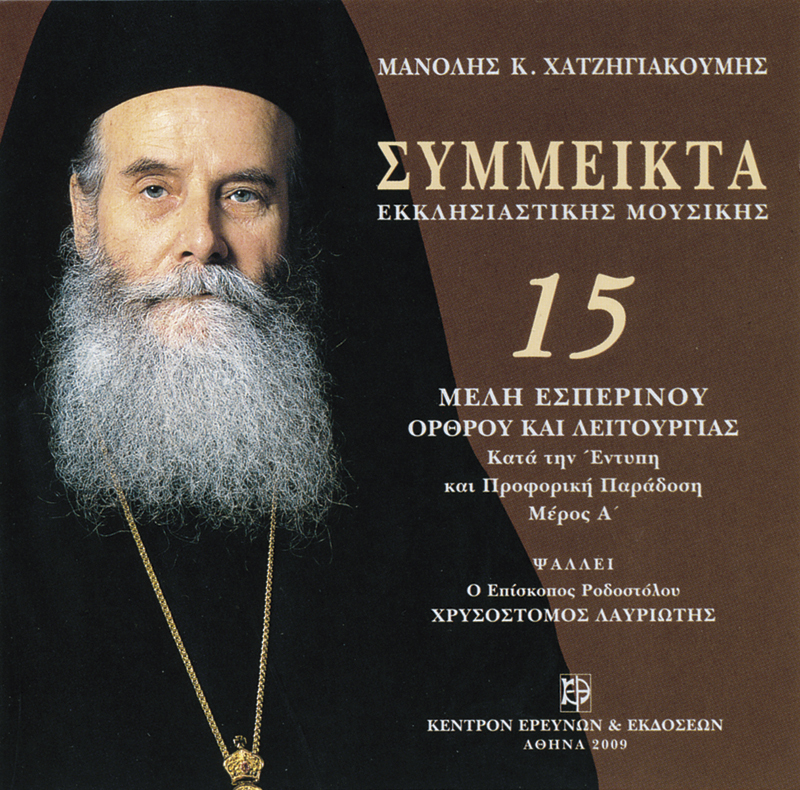 Monk Spyridon Mikragiannanites is the chanter. Duration 68:34". 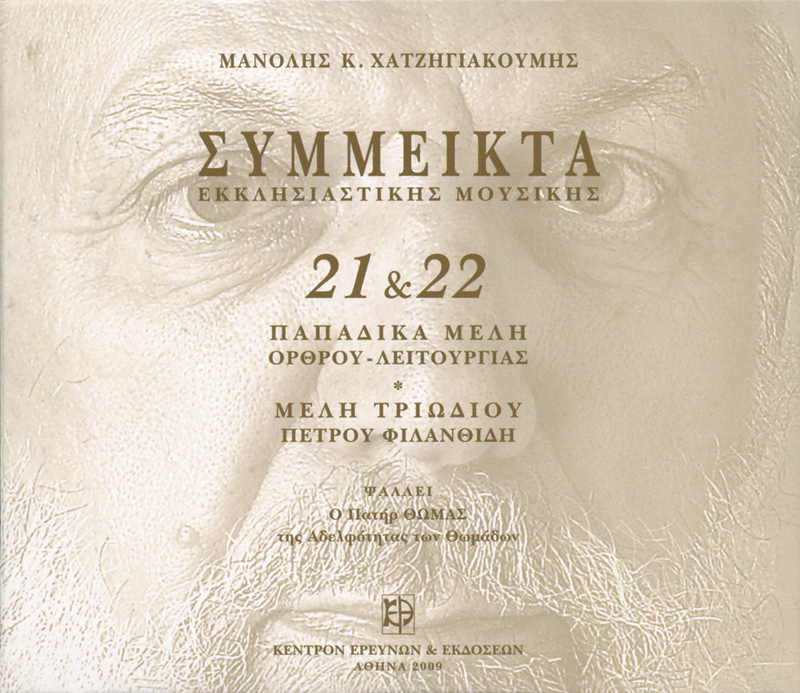 Twenty First CD (ΣΟ 21). Hymns of Papadike for Matins and Liturgy. Father Thomas of the fraternity of “Thomades” is the chanter. Duration 79:04". Twenty Second CD (ΣΟ 22). Hymns for the Triodion by Petros Philanthides (first half of 19th century). Father Thomas of the fraternity of “Thomades” is the chanter. Duration 68:28". 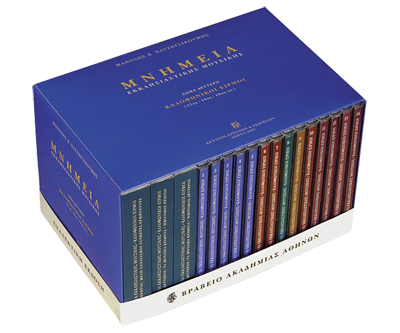 Miscellaneous Bʼ (Anthologies of Athos A΄) is available as a Corpus in a single box set of 12 CDs (ΣΟ 11 ‒ΣΟ 22) with three booklets of 704 pages (Volume 1, 228 pages; Volume 2, Part A΄, 212 pages; Volume 2, Part B΄, 264 pages). Athens 2009, ISBN 978-960-8009-36-3. 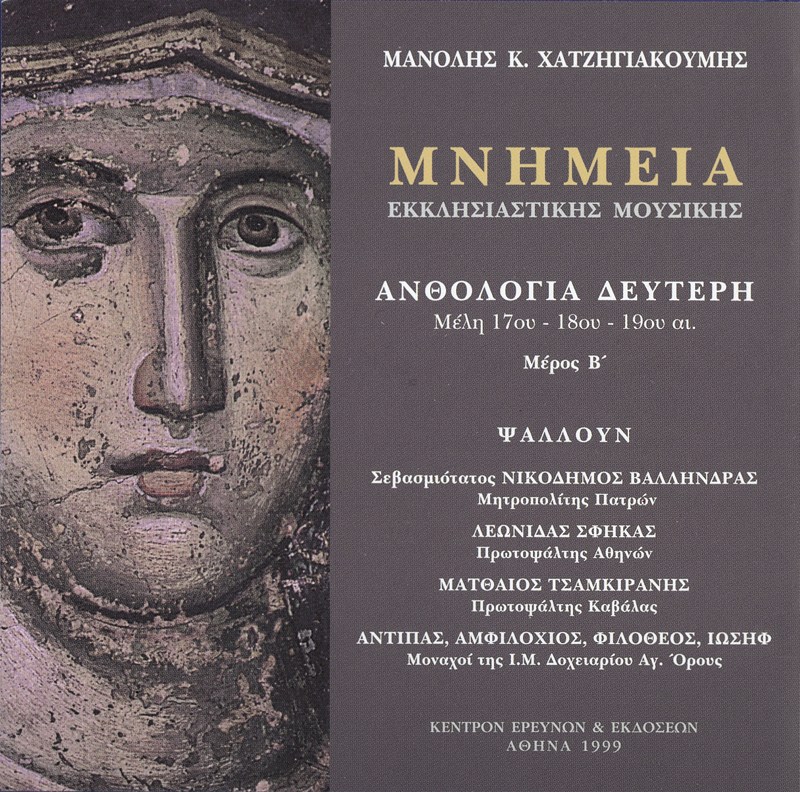 “Manuscripts of Ecclesiastical Music 1453–1820”. A contribution to the research on Modern Hellenism. Athens 1980. 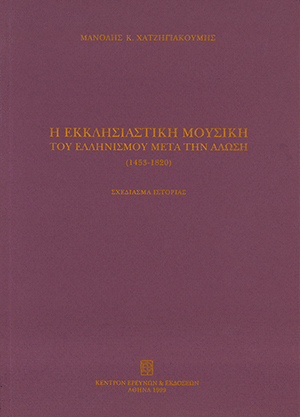 Illustration no 4, 506 pages, with 254 full-page colored photographic samples (Publication of the National Bank of Greece). The book is the first detailed historical, philological and paleographical research on Ecclesiastical Music during the Turkish Occupation. 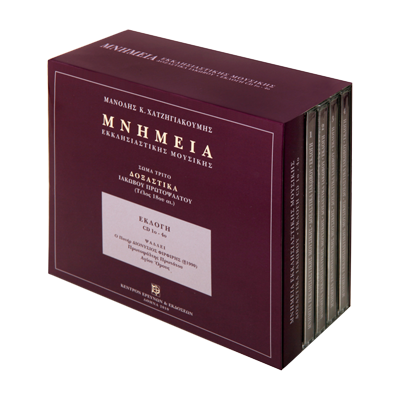 It is accompanied by one (1) vinyl disk with chanter Thrasyvoulos Stanitsas [and the digital edition “Miscellaneous” no 1] [Limited edition. Available as a book by the Research & Publications Centre]. 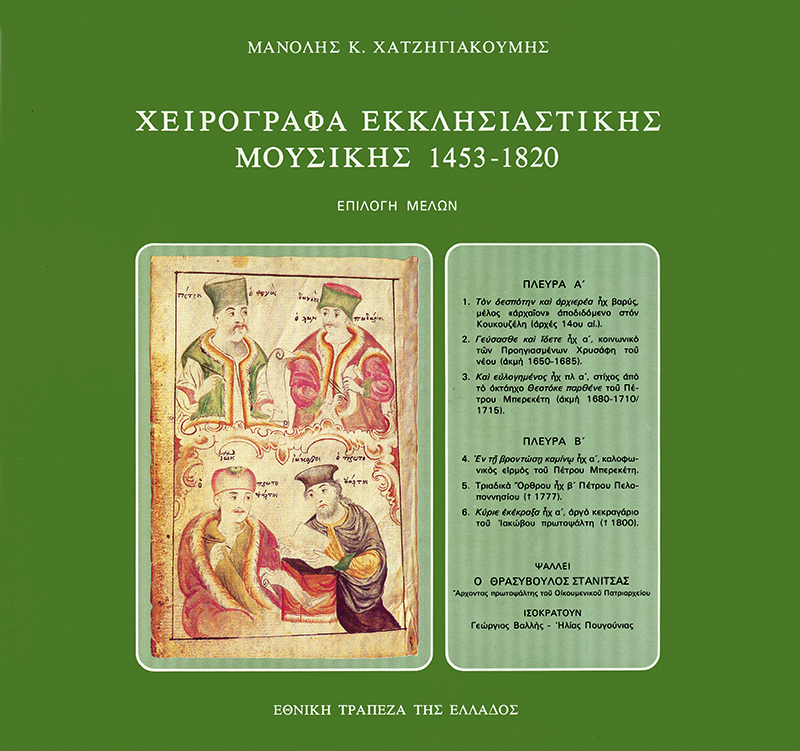 “The Ecclesiastical Music of Hellenism after the Fall of Constantinople (1453–1820)”. Sketch of History. Illustration no 8, 216 pages. 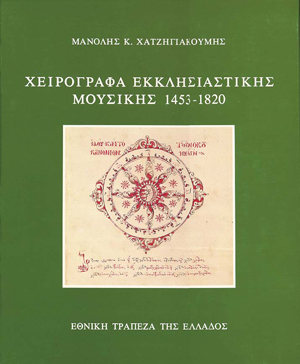 In this book the writer records thoroughly and in great detail the resourceful musical activity, the periods of decline and prosperity, the necessary dates, the composers, the Hymns, the music books, the innovative trend of the time, and the very rich manuscript production, from the Fall of Constantinople to the Greek Revolution. It is based exclusively on music sources (research on about 5000 music manuscripts). 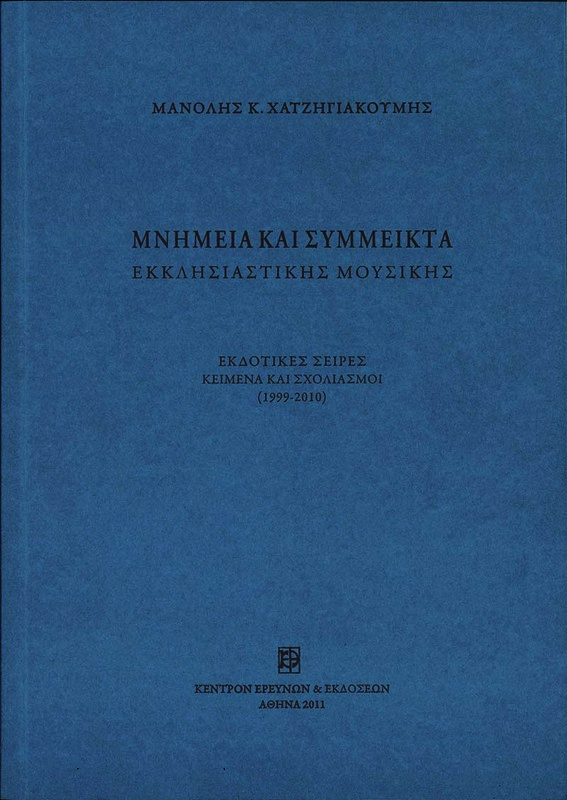 Richly illustrated [Research & Publications Centre, Athens 1999]. “Monuments – Miscellaneous – Archive of Ecclesiastical Music” Illustration no 8, 64 pages. Inventory and programme book which contains all the research and publication activities in discs and books. 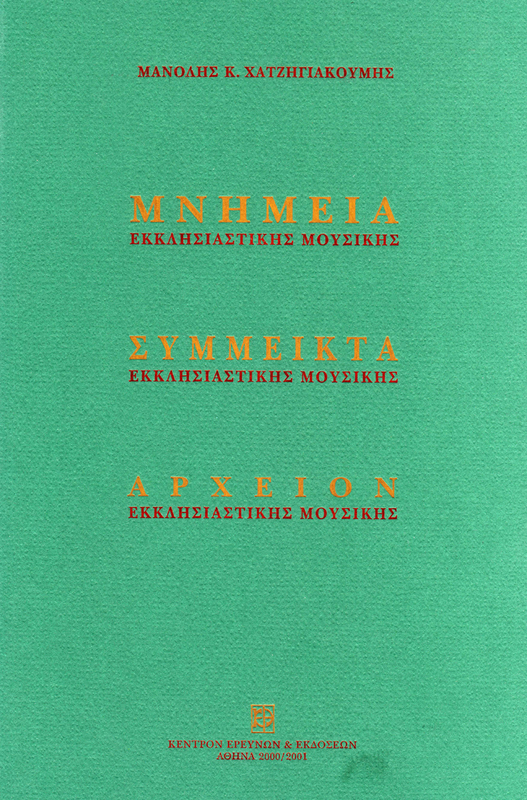 Richly illustrated [Research & Publications Centre, Athens 2000/2001]. “Monuments and Miscellaneous of Ecclesiastical Music. 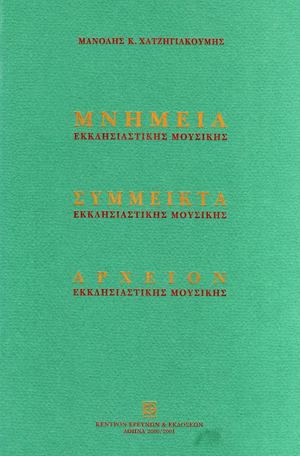 Publishing Series (1999–2009)”. Illustration no 8, 550 pages. It contains all the philological, historical and musical texts accompanying all the digital discs released until 2009 (94 discs in total) with limited improving interventions and rich illustrations [Research & Publications Centre, Athens 2011].